Please share this information with your groups. We would appreciate lunch payments being made by the deadline of 21 April to allow us to plan adequately. 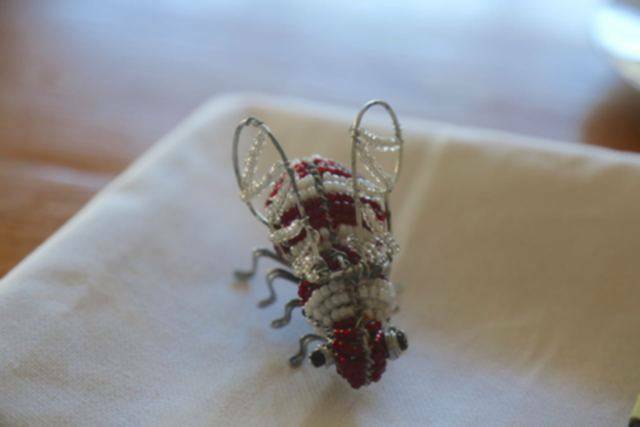 Please do encourage the ladies to buy a beaded bee in support of the 50 year reunion fundraising. Please remember the request that any gift ideas you have should first be checked with the principal to ensure the gift is suitable for the school’s needs. Please remember the requests that the ladies visit our website and facebook page for information. As time will undoubtedly fly by, we request that the reunion groups start sending the information requested in the information note for reunion groups co-ordinators. All relevant information has been supplied at the end of this email. Reasons to Attend School Reunions! Each day and milestone should be celebrated! 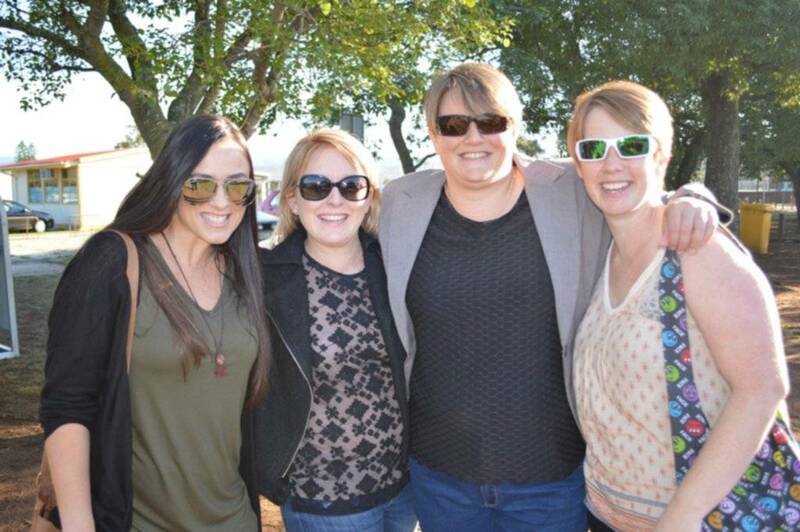 Because you're never too cool for your high school friends. you want to relive them with someone who actually cares! Ummm…who else is gonna fill in the blanks to your slipping memory? Thank goodness for name tags! If we get a good turnout, we could break a record or have a great status for our facebook page. Because you still think you have a crush on.. If you don't show up, we'll assume you still have big/long or even no hair. But, no one really cares about your hair! They want to see you! You know you really want to! Hey…Who cares if we don't fit into our old bellbottoms? Ya gotta stay huggable! Friends just want to see you! It's a small world and you will be surprised at how many wonderful "coincidences" life really holds! Enjoy an evening out without the Grandkids. (of your family,kids,grandkids, hot date,pets,car, vacations, etc!)! There's really nothin' like an"old"old friend! 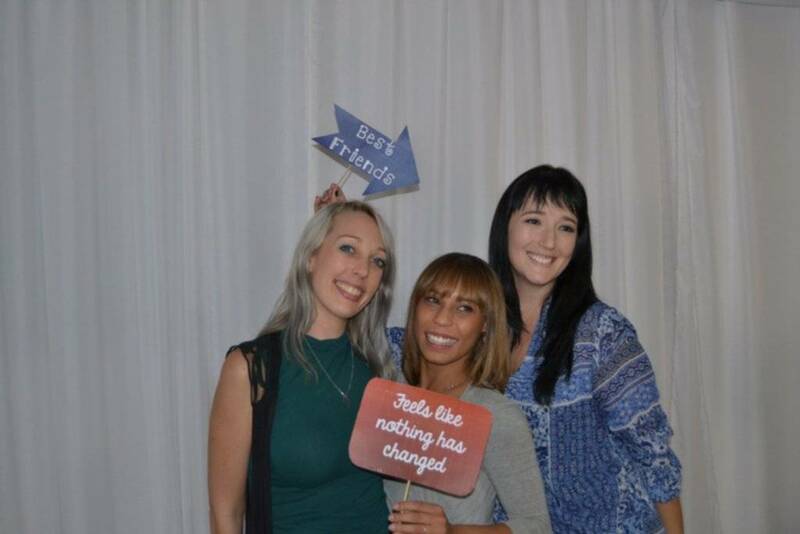 Renew not so old friendships, meet new friends! Get the latest gossip, as well as can be remembered. and the fun is in trying to figure out the difference between the two! Because you're curious and you HAVE to know what everyone has been doing for the last few years. 24.Did we mention there would be lots of FUN?? 26.You have nothing better to do. 28.To talk about the "Good ol’ Days"! You’ll laugh, cry and reminisce with some of your oldest friends. We're going to talk about things that you "remember"
Because you know you really want to! 33.You don't have to lie about your age. Did we mention there would be lots of fuN?? if only for a day or a weekend! Because we really want to see you!!!! 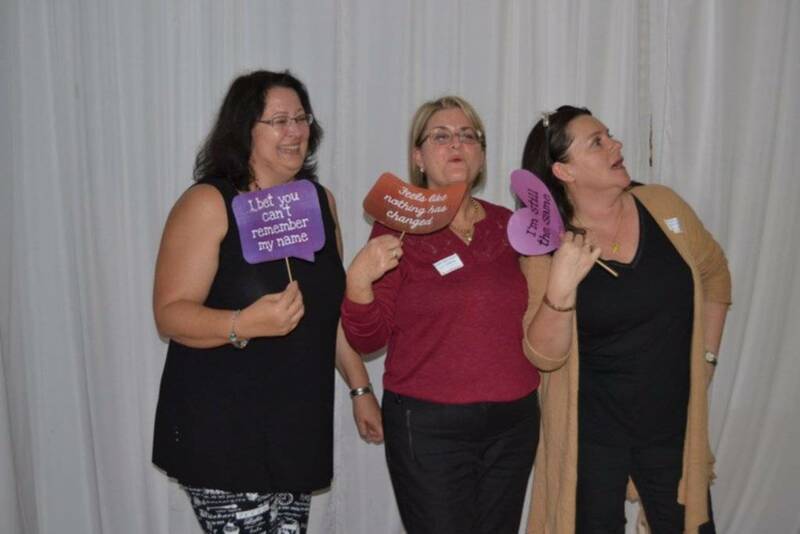 And finally, studies have shown that those who were initially hesitant about attending their reunions, discover it was The Event that they wouldn't have missed! 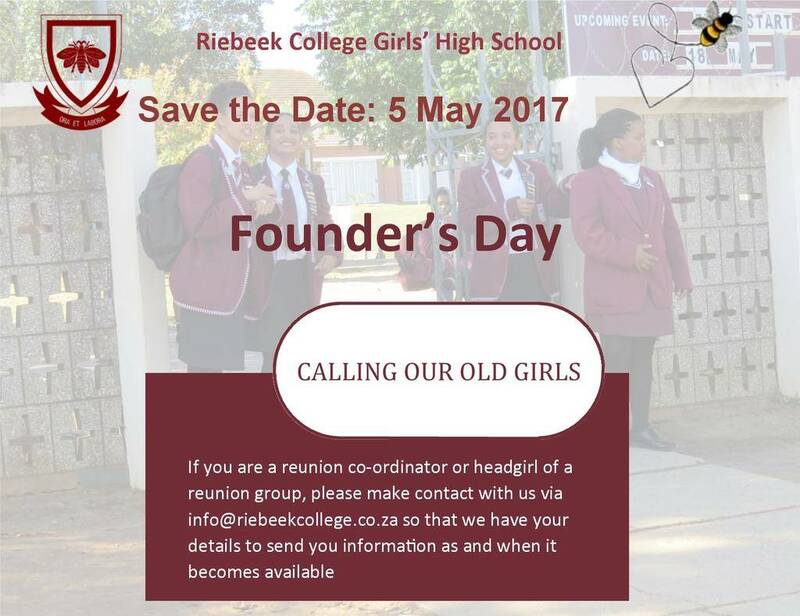 The Principal and Staff of Riebeek College Girls’ High School invite you to join them in celebrating their Founder’s Day on Friday 5 May. 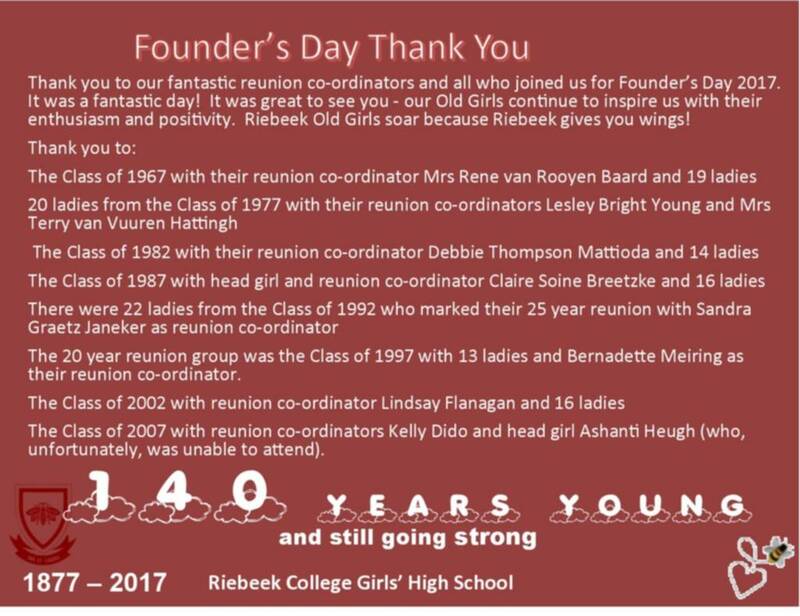 All past pupils of Riebeek are invited to attend all the events of the day, with the reunion groups especially requested to attend. 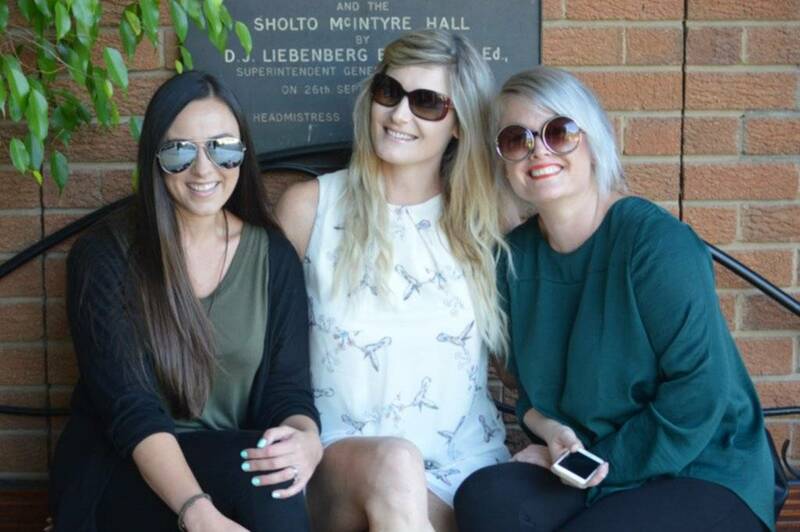 Our Old Girls did not have to matriculate with their class to be part of their reunion group. Reunion groups are also especially requested to attend the lunch. The traditional hockey match between the School’s First Team and an Old Girls’ Team will be played at 08:15 on the College Field. Tea will be served in the Beehive Student Centre at 09:30 and the official reunion photographs will be taken between 9.30 and 10 on the stands at the hockey field. There will be a special assembly at 10:30 in the Sholto McIntyre Hall. 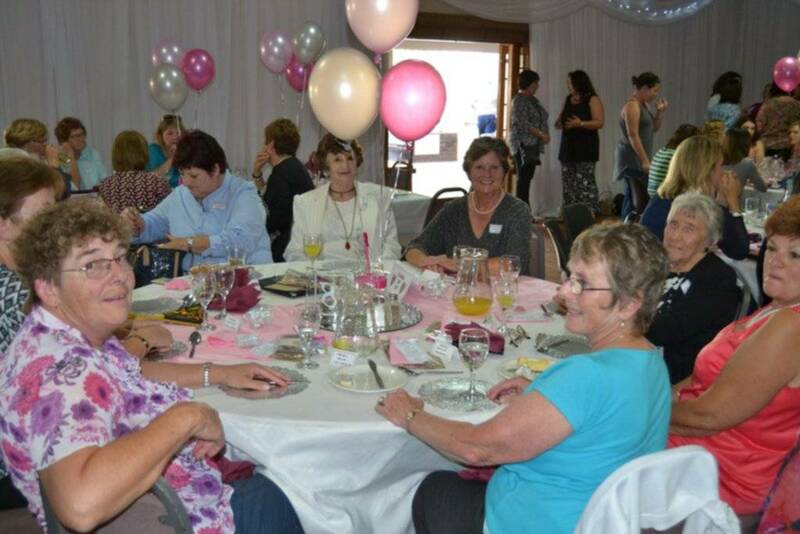 There will be an Old Girls’ Lunch at the Uitenhage Golf Club at 12.30 for 1. 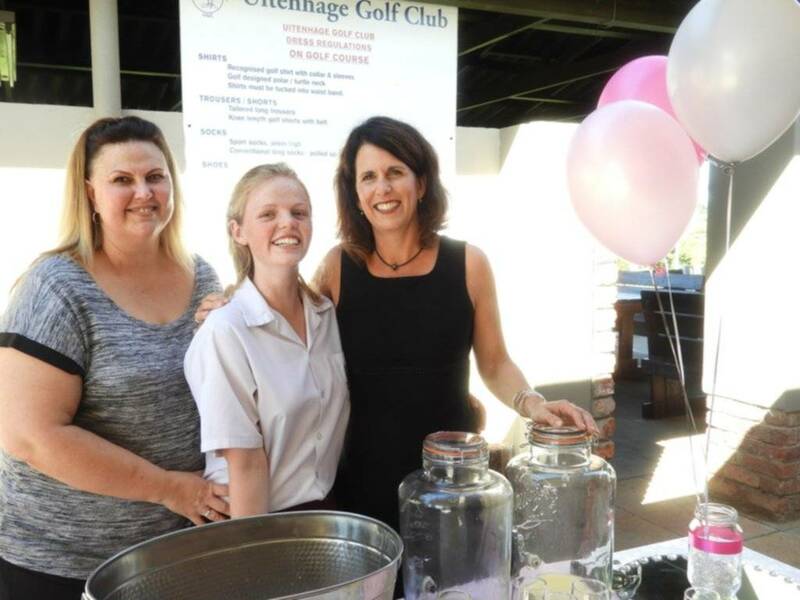 There will be an Old Girls’ Lunch at the Uitenhage Golf Club at 12.30 for 1 on 5 May at a cost of R140 for a three course meal. Reunion groups are especially requested to attend. Make a payment with the reference being your surname followed by year of your reunion group. 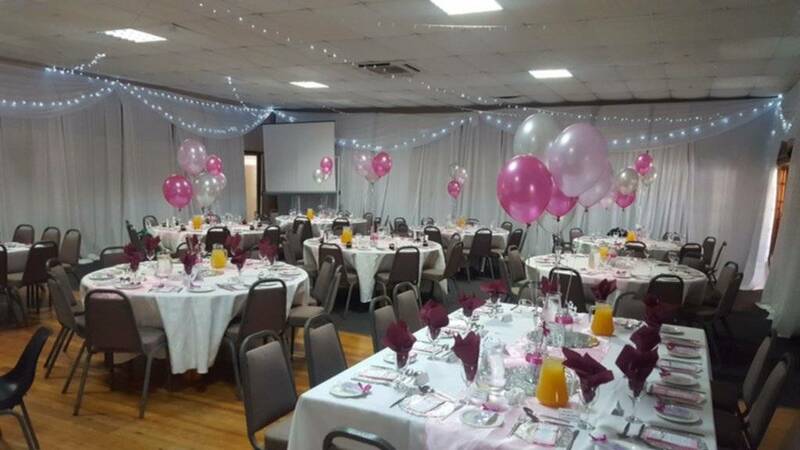 Proof of payment MUST be forwarded to bursar@riebeekcollege.co.za along with any seating, dietary requests, maiden name/ married name and class year. Do cc your reunion co-ordinator when confirming payment. 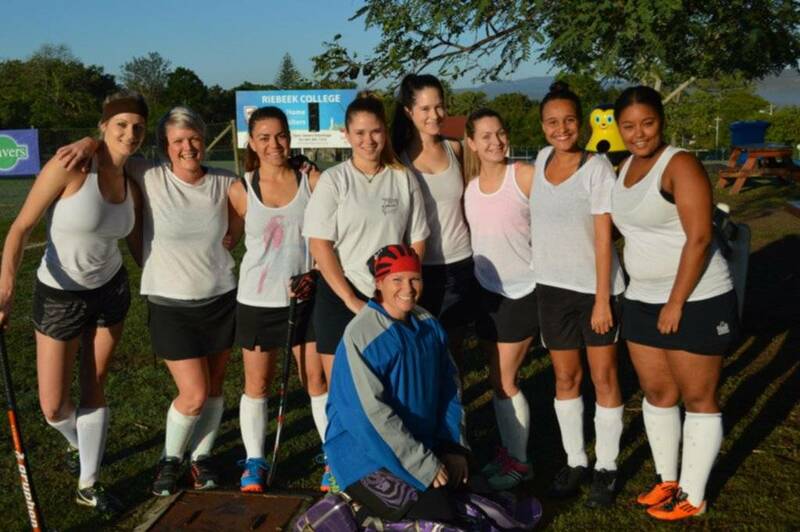 Please promote the hockey festival to your group. 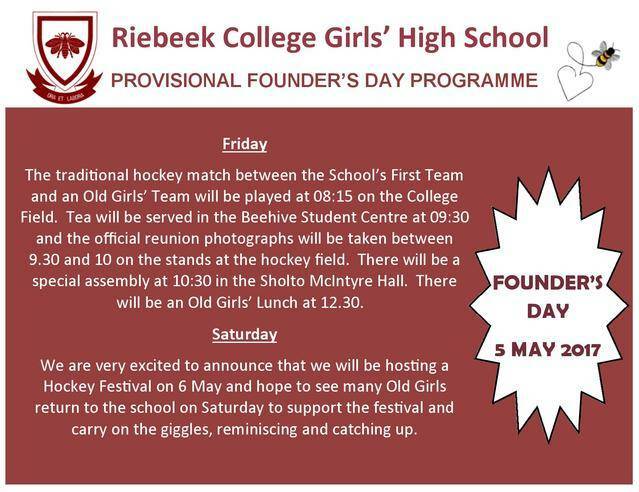 We are excited that our annual Hockey Festival will be on 6 May and hope that the Old Girls will support. Collect all the particulars of the Class with first names maiden names and married names (if applicable) and email addresses and then indicating on the list who is attending and who is not, who is coming from far and any information about the Old Girls that could be interesting to share with the school. Collect photographs (scanned in for digital versions) for sending to me; and create the posters for the boards for display in the foyer on Founder's Day. 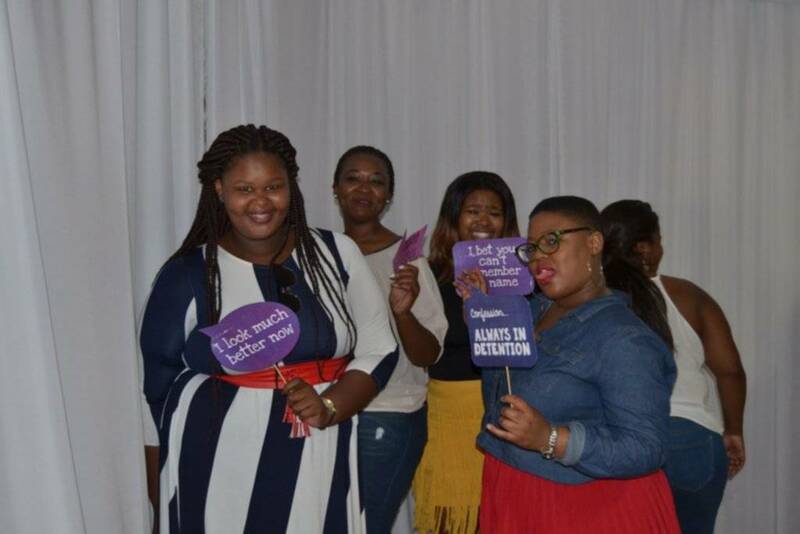 Be the cheerleader for the group begging and persuading ladies to attend Founder's Day. We urge all our Old Girls to use the MY SCHOOL CARD and to have Riebeek as a beneficiary. MySchool MyVillage MyPlanet is one of South Africa's biggest fundraising programmes and allows you to make a difference, just by shopping. Every time you use your card at any of the partner stores they'll give back a percentage of your purchase value, on your behalf, to Riebeek at absolutely no cost to you! Get your free card today. Every swipe counts! You can apply online at https://www.myschool.co.za/supporter/apply. Partner outlets include Altech Netstar, Cartridge Recycling: greenOFFICE, Engen, kalahari.com, MegaMobi, MySchool Holidays, Power24.co.za, Reggies, Toys R Us, Waltons, Woolworths, Woolworths Rewards. We will require your assistance in making sure that the official photograph is taken. A display for the foyer is required. The measurements of our black boards are 1.37m (height) by 900cm (width) and we have larger white trestles that measure 1.2 m(width) by 1.8 m (height). 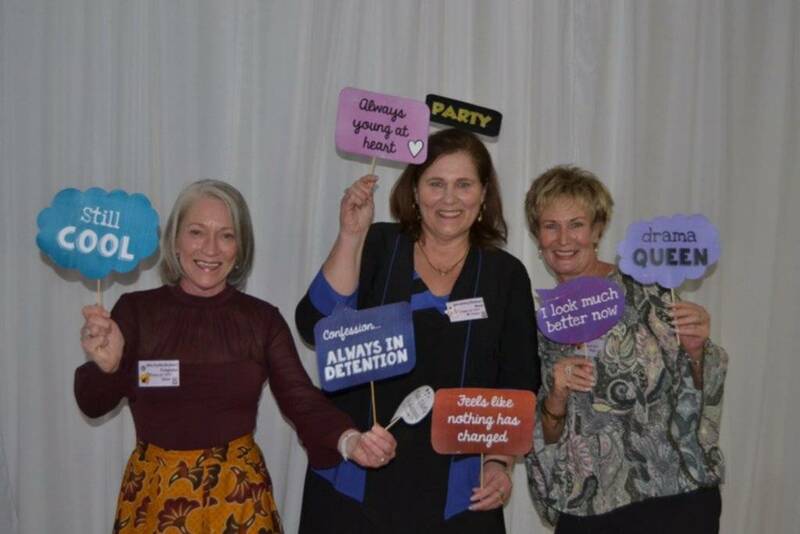 We request that you arrange name badges for the ladies in your reunion group. A table will be set up at the student centre (next to the hockey fields) where you could place your name tags and distribute them. 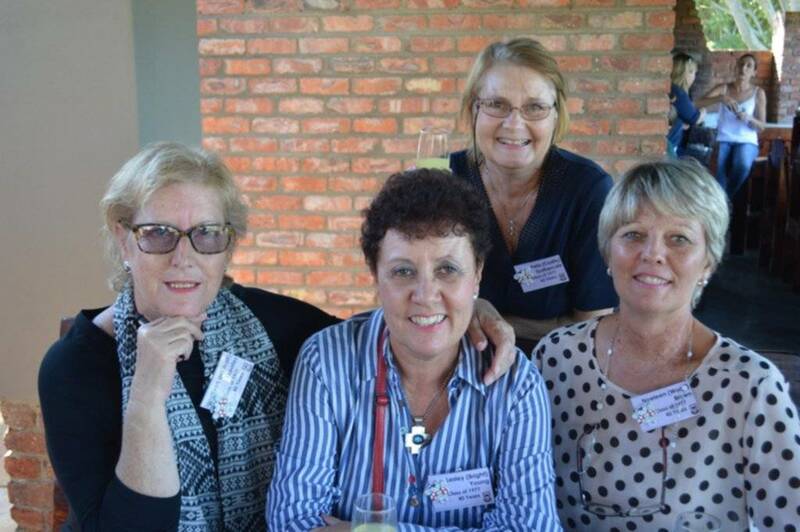 Ladies who did not matriculate with the class but attended school with the class are welcome to be part of the reunion group. 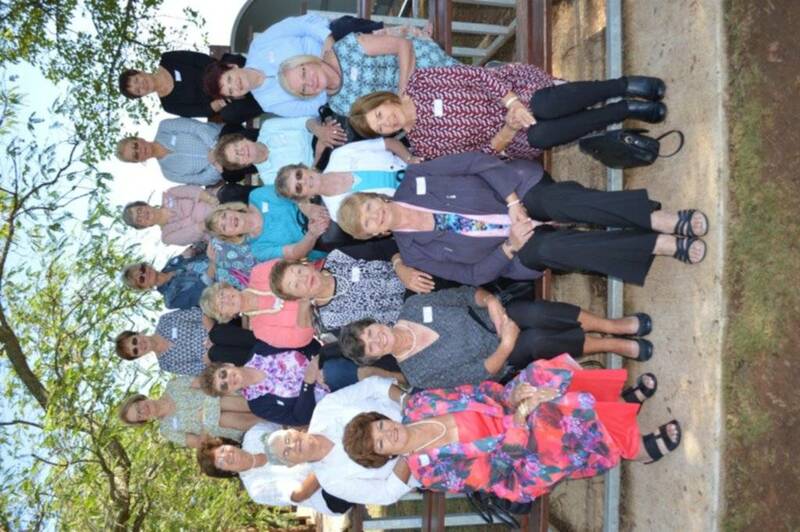 Reunion groups who wish to make a donation to the school should contact Mrs Stear to discuss a specific item or could make a financial donation to Mrs Stear for her to allocate the funds to a project on our list. Please email the following information to jrgerber@isat.co.za : photographs; names of those who have passed away between May 2016 and May 2017 (not necessarily from your class: first name, maiden name, surname, year of matriculating); names of those who have travelled far, those who have passed away from your class and any special messages of goodwill or greetings from your reunion groups; a list of any special memories of your school years to include in our speeches, names of those attending. This can be sent in stages as you collate your information. After the event, we ask for a school magazine article from you about the reunion and your school memories, some photographs form any follow up reunions you had over the weekend and assistance with the caption for the official photograph (which will be emailed to you). 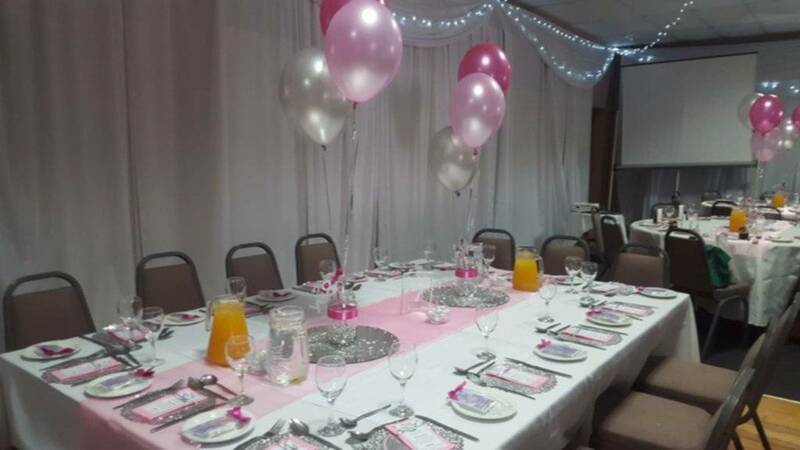 Help us to keep a check on the numbers for each table at the lunch by asking the girls to let you know when they have paid and to let you know too of any special dietary or seating requests made so we can be sure your table is well organised for the reunion lunch. 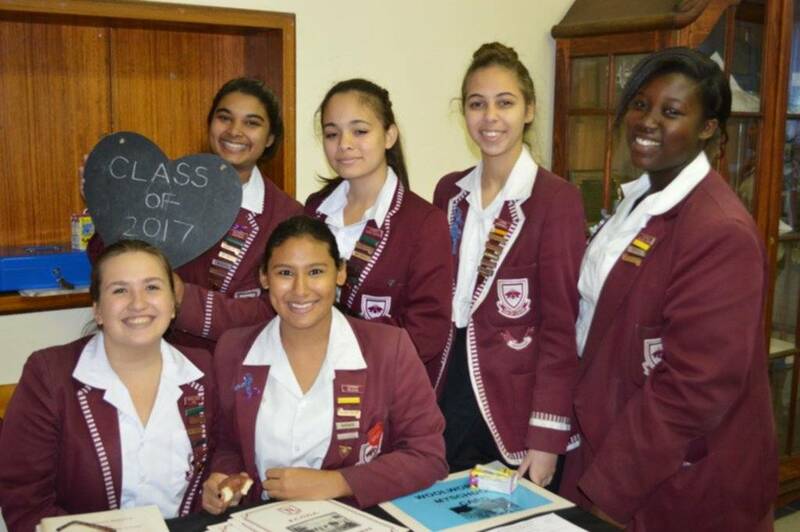 Note that copies of magazines of your year (if available) and other years are sold at the school on the day of the reunion for R100 each or with a discount for purchases of a few magazines. You can also collect questionaires from the ladies for possible inclusion in the school magazine and you could use bits and pieces of them to make up a MEMORIES BOOK in print or digital version to share with your grade - see attached possible questionnaire but you can create your own with these possible questions. It is also available to fill in on our website. Where do you work and what is your profession, job title, position? Tell us a bit about your career path, highs and lows professionally. Are you married? When did you marry? What is your husband’s name AND what is his profession? What lessons did you learn at Riebeek? What are some of your memories of Riebeek? 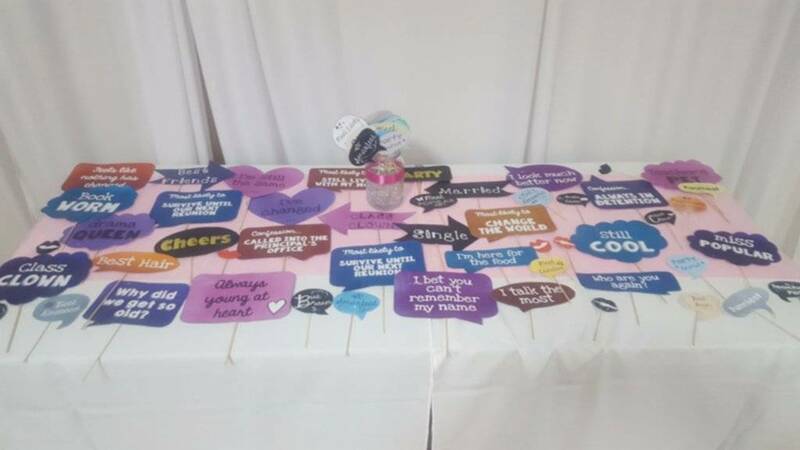 Which of the values of Riebeek have you kept throughout your life? 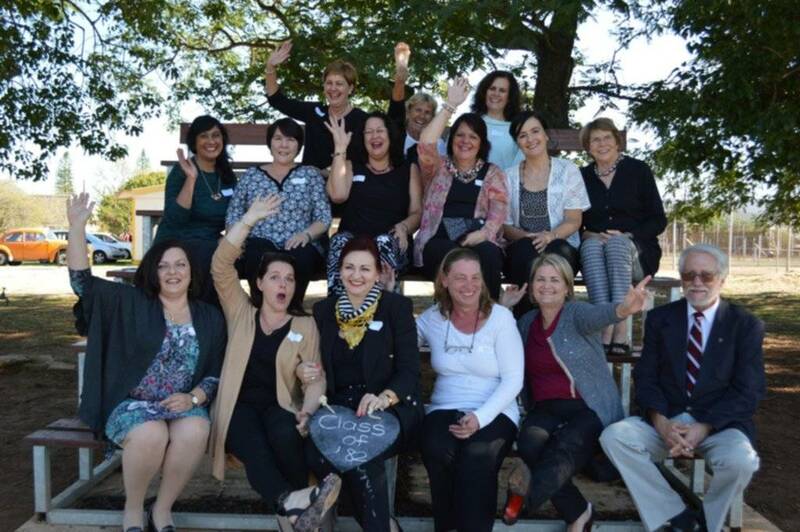 Which Riebeek OLD GIRL/ TEACHER had the greatest impact on you and how/why? Orders: Email Renee Baard: reneebaard@gmail.com or phone her on 0727979369. 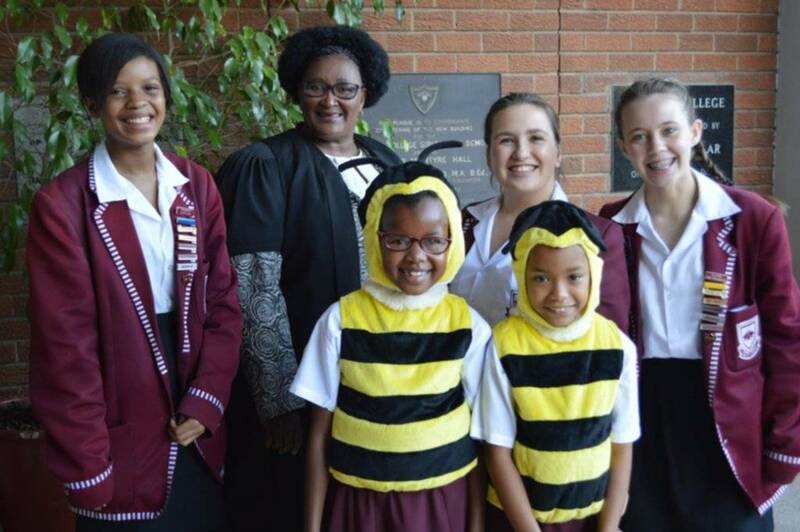 Bees will need to be collected on 5 May at Founder’s Day in the foyer at a table hosted by the Class of 1967. Any queries, please contact Mrs Renee Baard. 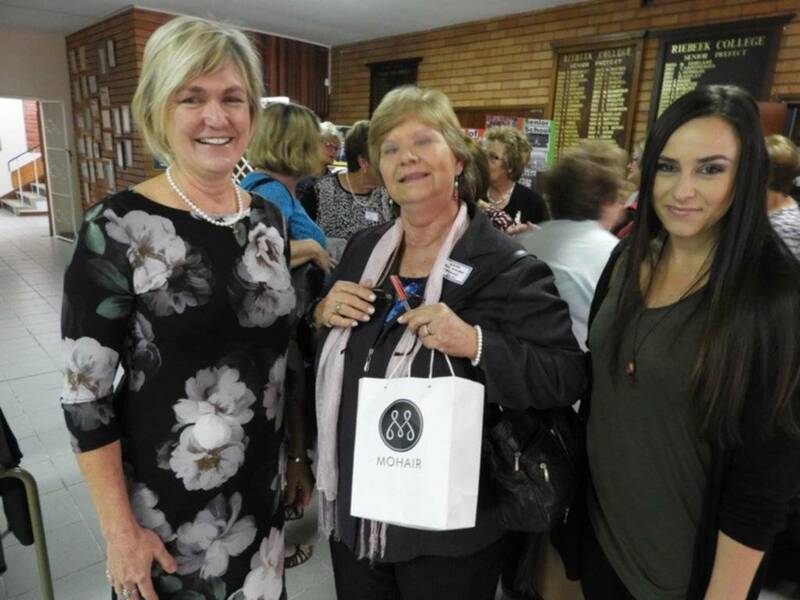 The 50 year reunion group, the Class of 1957, is a particularly lively group who have undertaken the support of a community upliftement project of ordering beaded bees (the emblem of our school includes a bee) and selling these to raise funds for the school. 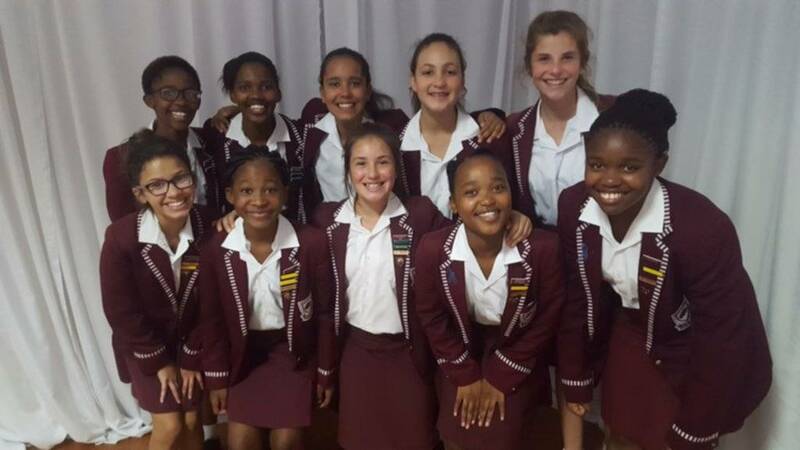 In its 140 years, Riebeek has celebrated many milestones and developments and is justifiably proud of the girls who have walked the corridor of this school and have taken to heart its teachings of compassion, communication and striving to make a meaningful contribution to your community. 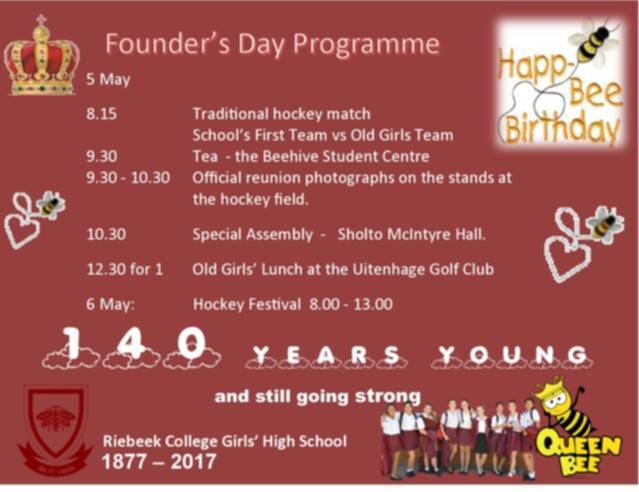 Old Girls from the Classes of Class of 2007, 2002, 1997, 1992, 1987, 1982, 1977, 1967, 1957 will be joining us on 5 May at the school for a programme that includes hockey, tea and the Founder’s Day assembly followed by a reunion groups’ lunch at the Golf Club. 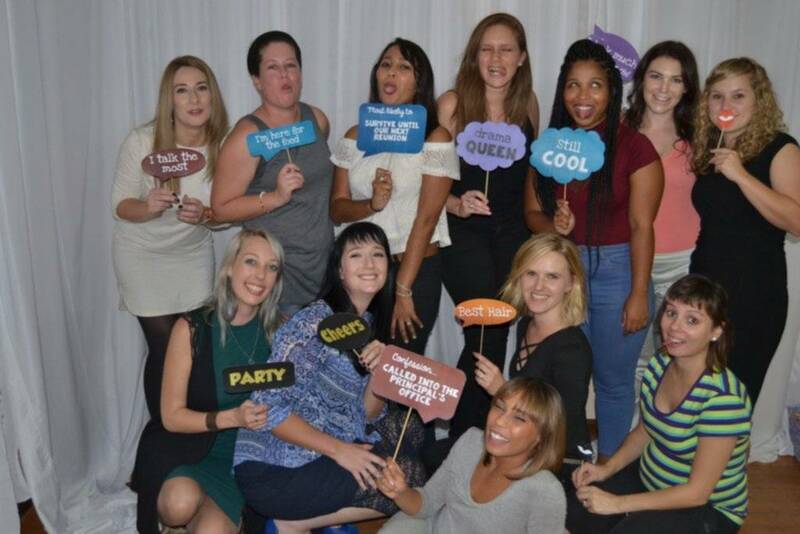 and Ladies of Riebeek College. I welcome you all to this 29th Founders Day Service and the anniversary of the founding of our school 140 years ago. Marcus Garvey said, “A people without the knowledge of their past history, origin and culture, is like a tree without roots.” How wonderful it is to have the opportunity of uniting the past and the present by honouring our roots, our past history. What a privilege it is to pay tribute to all those who have made a contribution to Riebeek College because our 140 years of success is after all the sum of all the contributions of our founding father and all who have been a part of its history. It is a time when we remember with gratitude the founder of Riebeek College, Dominee Braam Steytler of the NG Kerk in Uitenhage, who gave his name to the town of Steytlerville. 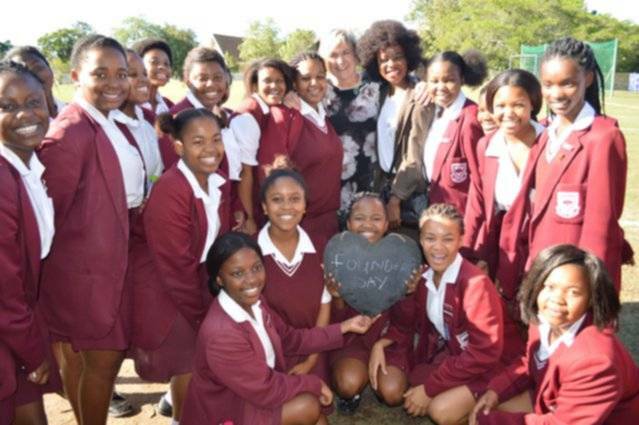 He planted the seeds and gave Riebeek her roots in his drive to establish a quality school for girls. 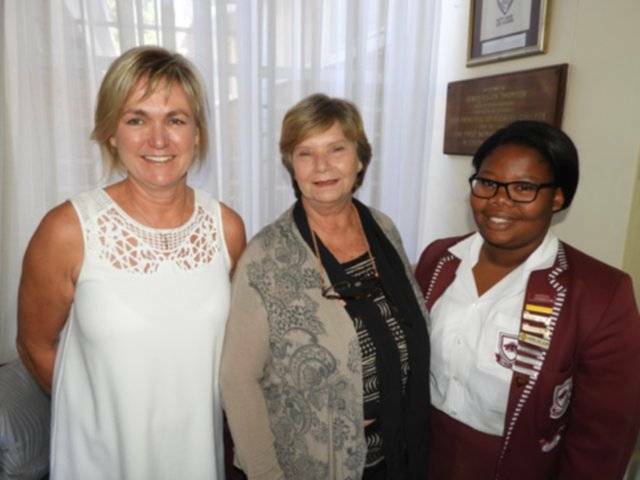 Fortunately, for all of us his efforts were successful and Riebeek continues to thrive as she grows. Back then, 140 years ago, women were considered to be inferior to men. Can you believe that, girls? Men better than women? I don’t think so. Life was not easy for women in those days. They had to endure sexism on a daily basis. Women were only admitted into universities for the first time in the late 1870s and we are proud that one of our former Principals, Mrs Agnes Thomson, was the first woman in South Africa to gain a degree. In 1889 she completed her Masters Degree with distinction at Cambridge University. However, she only had her degree conferred upon her 60 years later as no woman in the 19th century was allowed to receive such a degree. It was in 1930 that women in South Africa were allowed to vote, and sadly African women had to wait even longer. Married women teachers were only given professional status in 1980. These married women were paid less than their male counterparts and could not be part of the permanent staff until the 1980s. Thus, we ought to be grateful to our founder for recognising the need to educate women. 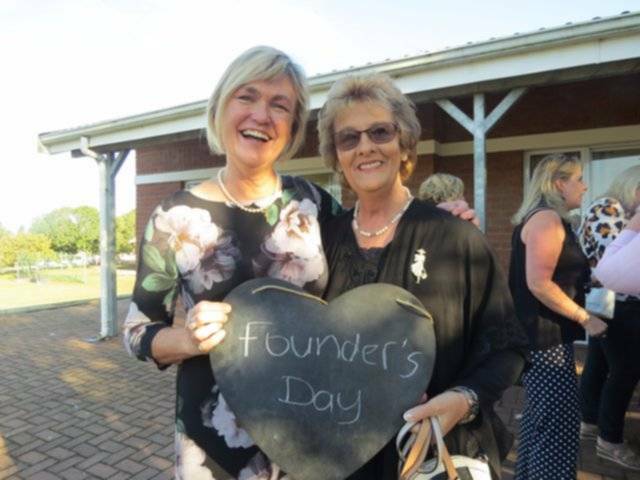 In addition to our founding member and the NG Kerk, we pay tribute to all the past Principals who helped to shape the history of this school. We are honoured to have 2 past Principals here today. 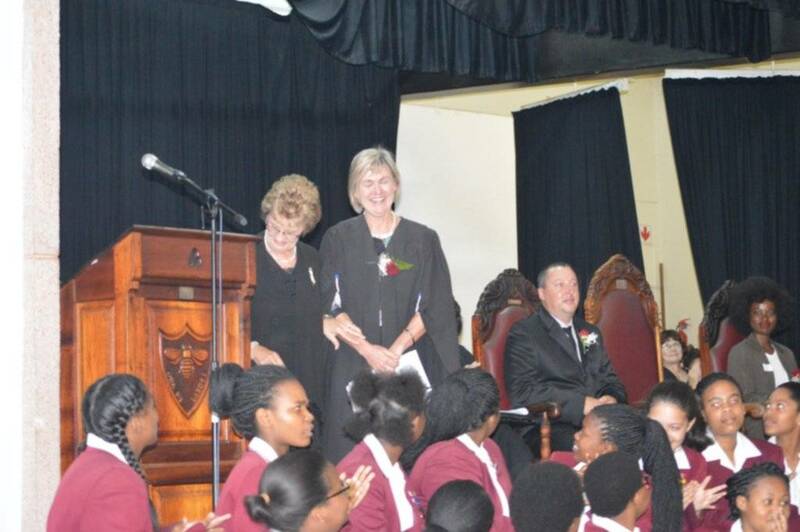 Mrs Natalie Stear, Principal from 1988 to 2000, and also my Mother-in Law. In her tenure, the tradition of a Founder’s Day Service was started, in 1988. 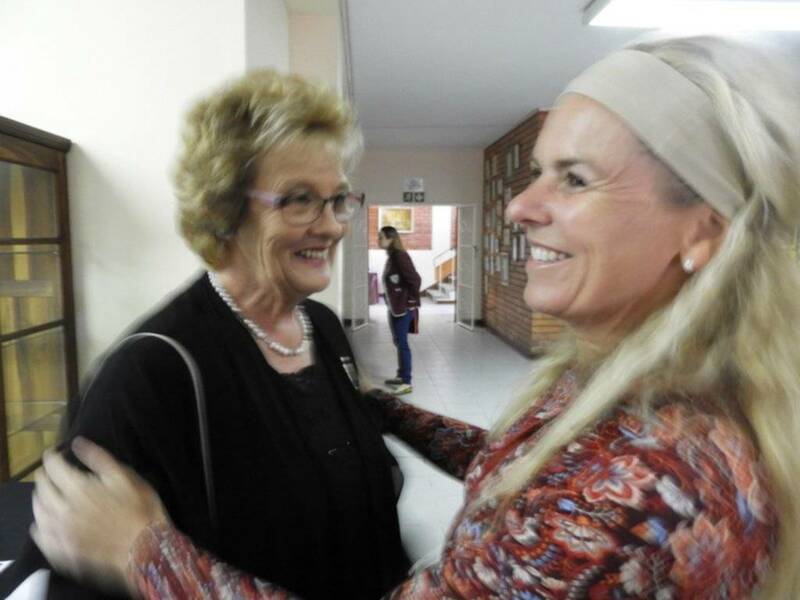 In addition to this, she oversaw Riebeek College being the first then Model C school to vote to open her doors to all races in 1990. The second past Principal present here today is Mrs Marilyn Dodd Woods. 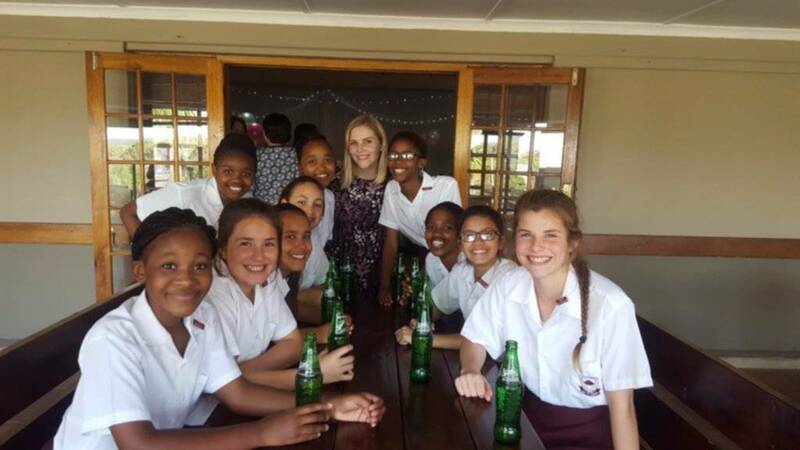 During her time as Principal, she coined the phrase, “Once a Riebeek Girl, ……. …. rooting us in another proud tradition. The new admin block was built and named the Marilyn Dodds Woods Wing and we all became familiar with the fruit of the spirit. 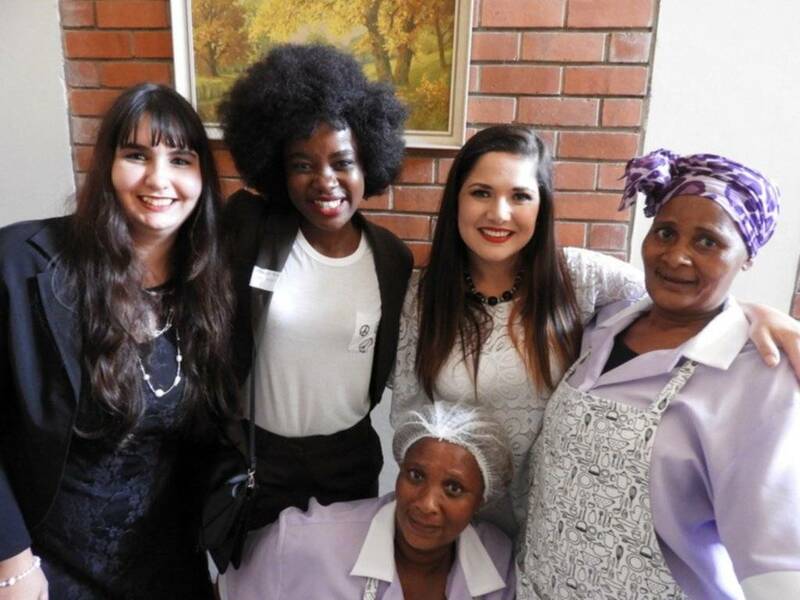 Riebeek continues to produce admirable young woman who make us proud of our roots. These young women have discovered, that like a tree, you have to find your roots and then you can bend in the wind. 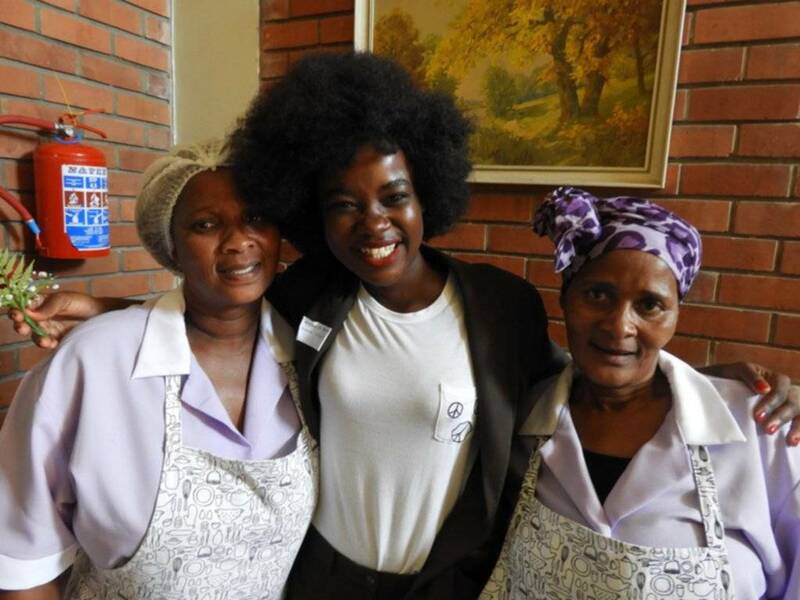 Hlomela Bucwa (Class of 2010) was sworn in as the youngest South African parliamentarian and Noni Agcobile Mafani Mbete (Class of 2008) was crowned Mrs Africa World. 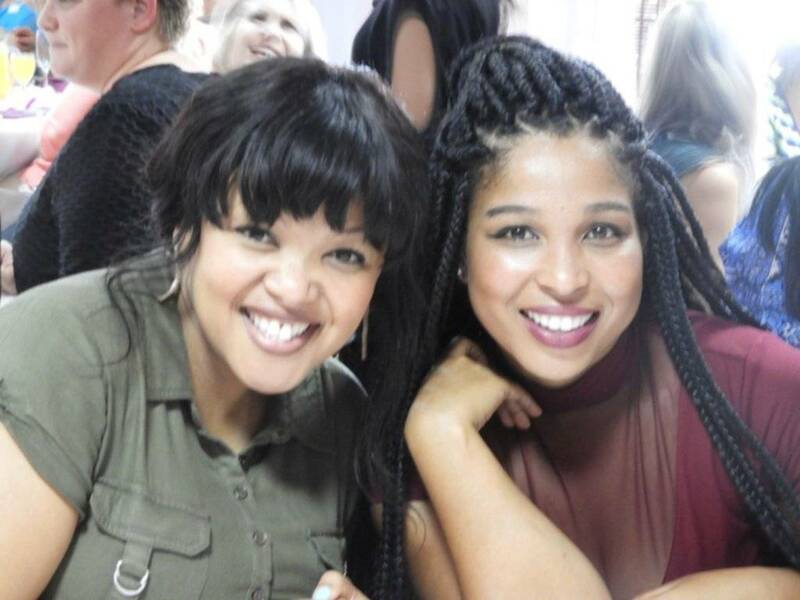 Zikhona Bali (Class of 2007) lights up our television screens starring in productions such as IS'THUNZI. 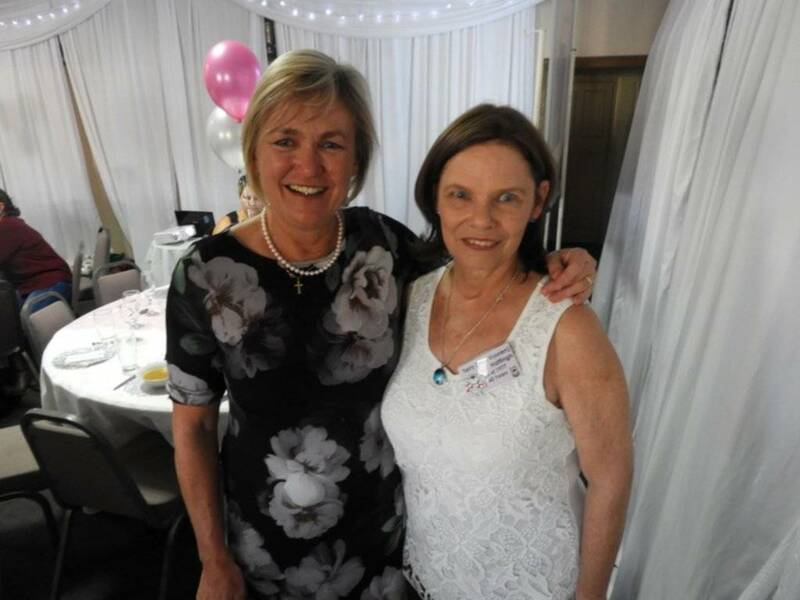 Bernadette Maguire is a Carte Blanche producer. And in future years I will look forward to reading out the names of the girls seated here in the hall who I know are going to go out there and make a great impact. 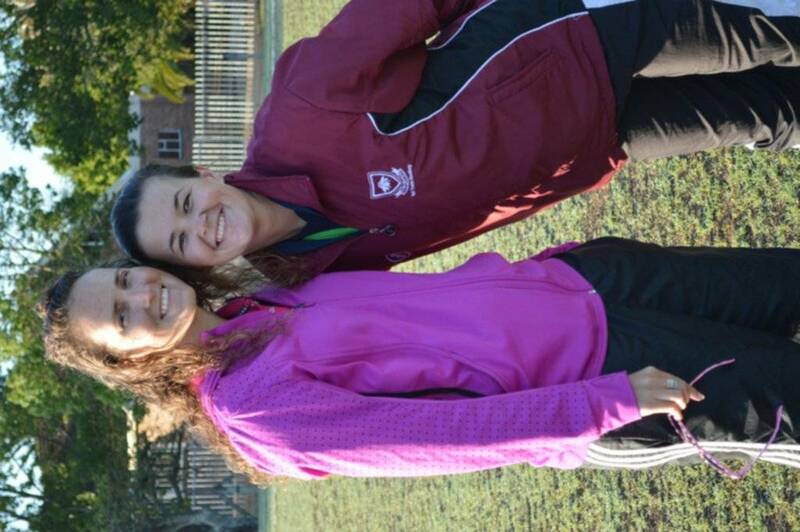 We have a number of staff members at Riebeek College who now teach at their Alma Mater. 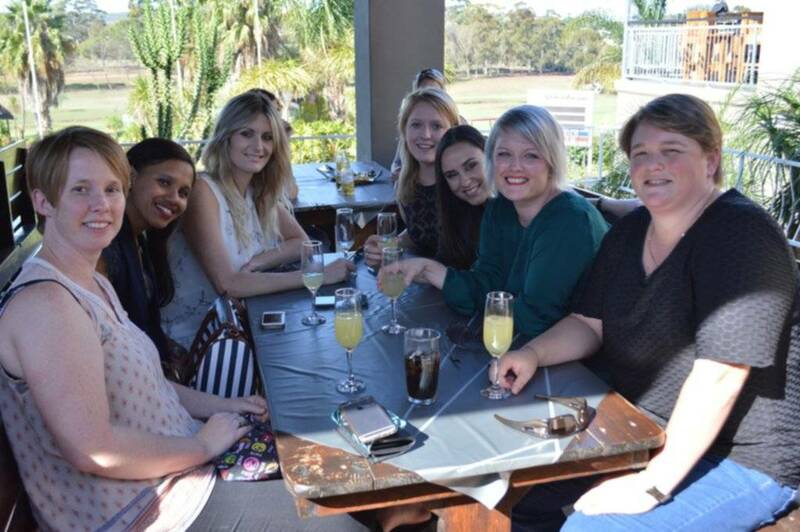 They are Mrs Skeates, Miss Johnson, Miss Hattingh, Mrs Chrysostomou , Mrs Woods, Mrs Stroebel, Mrs Peltason and Mrs Gerber. The fruit has not fallen far from the tree! 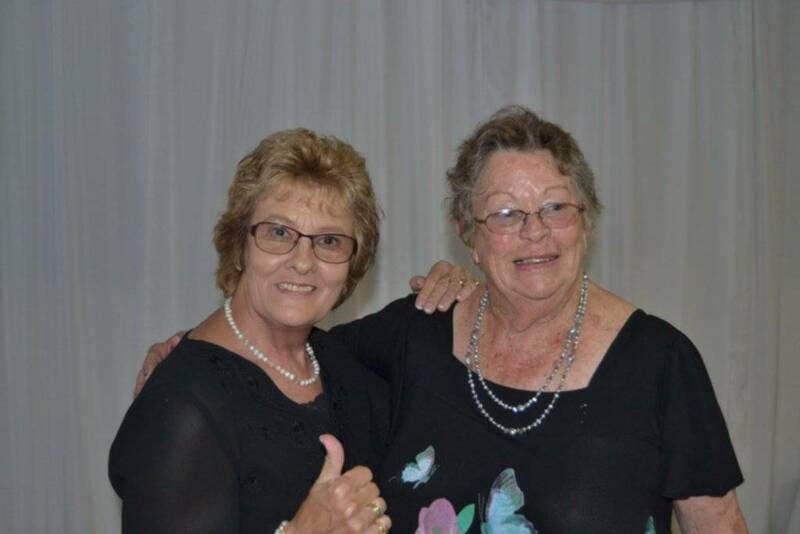 Mrs Boscombe and Mrs Barnard in the Admin block and Mrs Wilkinson from the Aftercare at the hostel,are also Riebeek Old Girls. 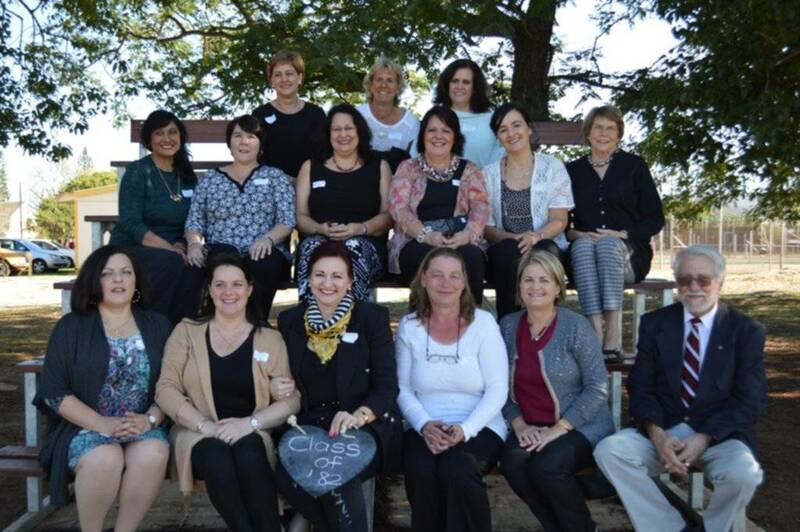 That makes a total of 8 Old Girls teaching at Riebeek and 11 in total working here. 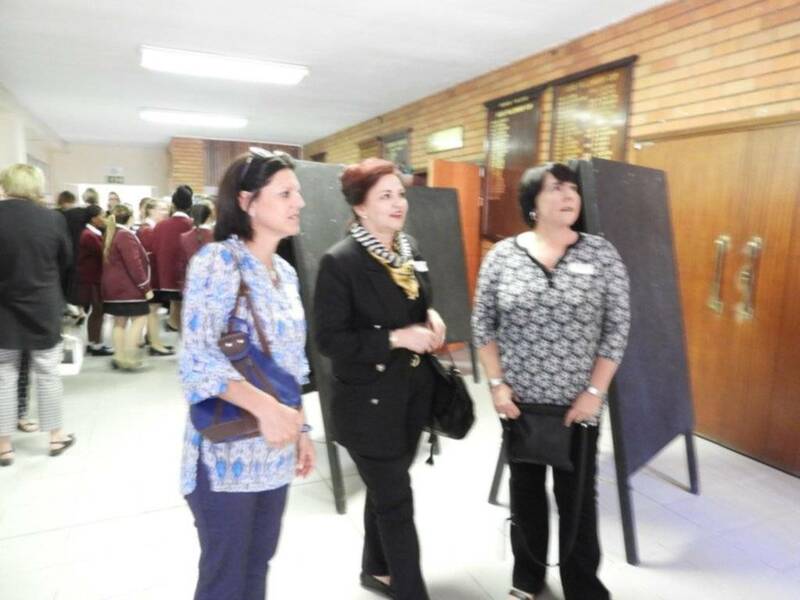 A number of the staff’s children have also been educated at Riebeek College; Mr.Reynold, Mrs Stark, Mrs Elie, Mr Jonas, Mrs Myburgh, Mrs Bean, Mrs Pelatason, Mrs Boscombe, Mrs Wilkinson and my own 2 elder daughters were schooled at Riebeek. My eldest daughter, Clare, who was deputy Head Girl in 2002 , is here today and is celebrating her 15th school reunion. “Miss Brehm, who was a staff member of the school, while on a visit to London, commissioned a jeweler to fashion the “Bee” into a brooch, intending that it be worn as part of the school uniform. This idea proved to be non-feasible and she contented herself that only one be made for her. One day, while on a visit to our home, she presented this to my sister, Dorothy, who treasured it as a gift from a valued family friend. 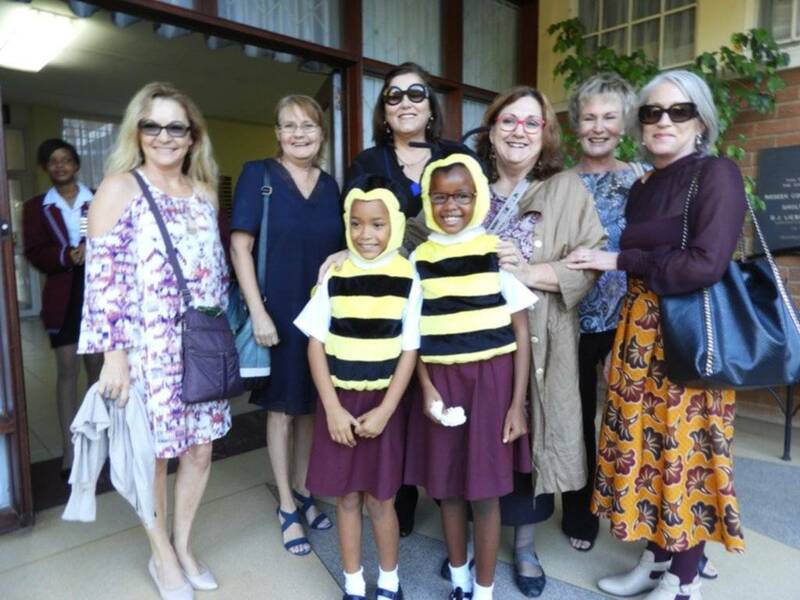 Subsequently, Dorothy handed “The Bee” to Miss Bartlett, intending it should be held in trust for each succeeding Headmistress of Riebeek College to be worn when the occasion deemed it fitting. I think this was a happy gesture lending an added charm to the tradition. 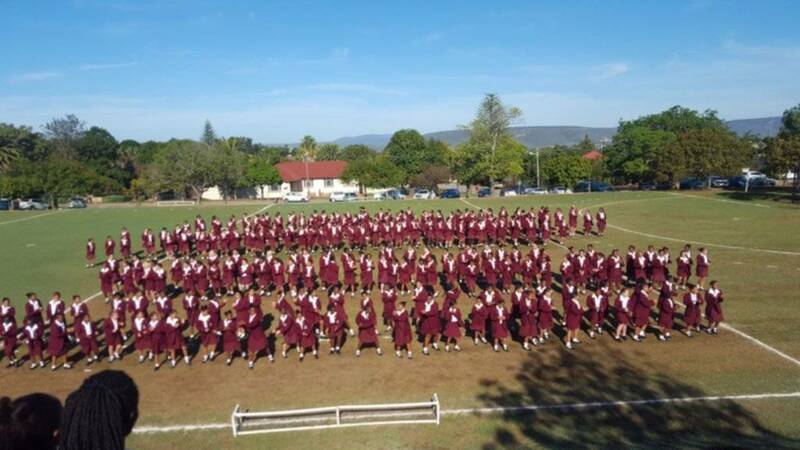 It only remains for me to wish you a most successful, memorable and joyous linking of hands with the past on this day, and that Riebeek College continues its successful path into the future”. 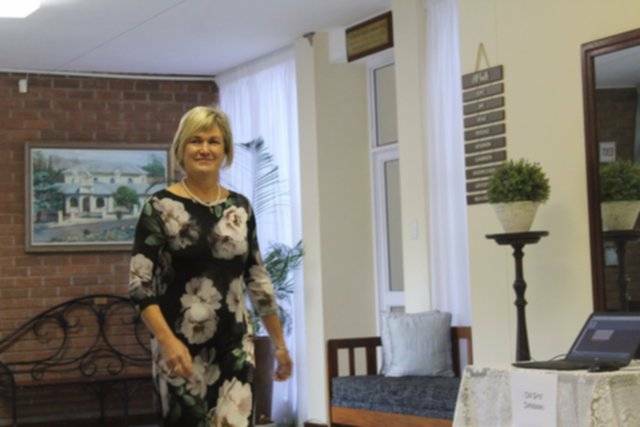 In welcoming you today to this linking of hands with the past, I am proud to be standing here as the 15th lady principal of Riebeek College. 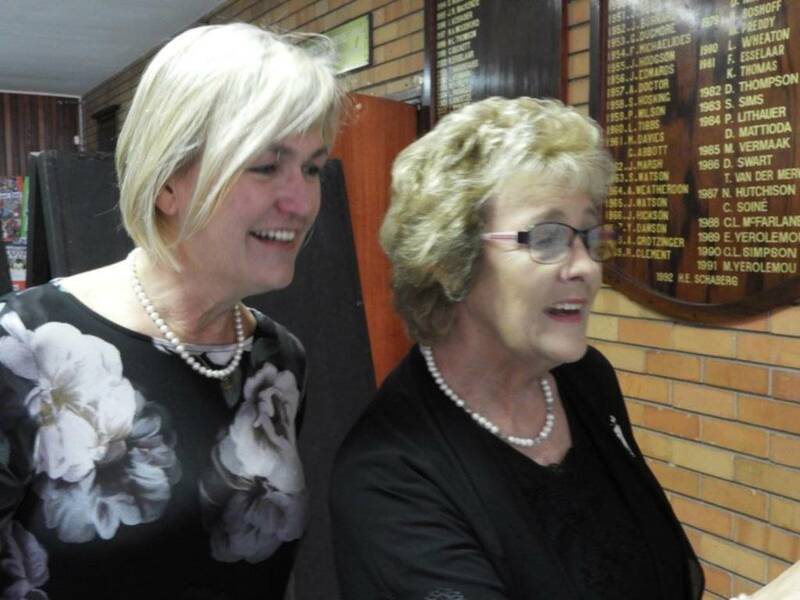 I have no doubt that Riebeek will flourish in future years as her roots are well grounded. 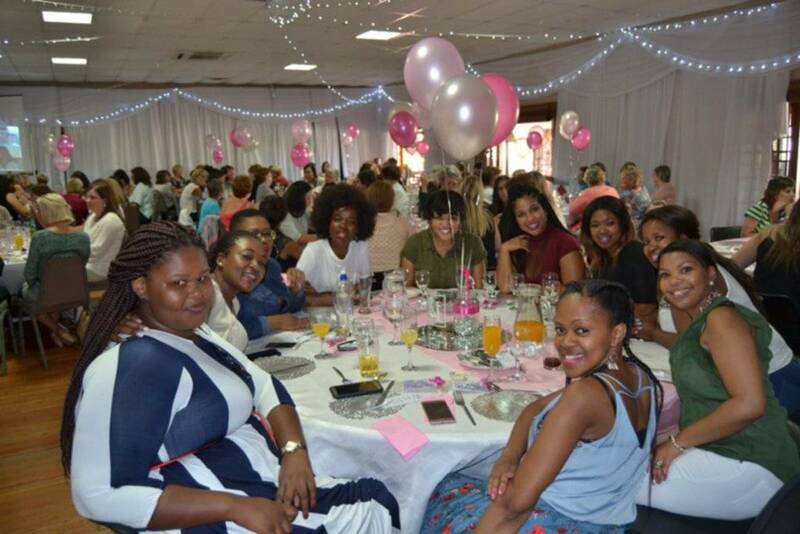 Zikhona Bali matriculated from Riebeek College in 2007 and is celebrating her 10th School Reunion today. 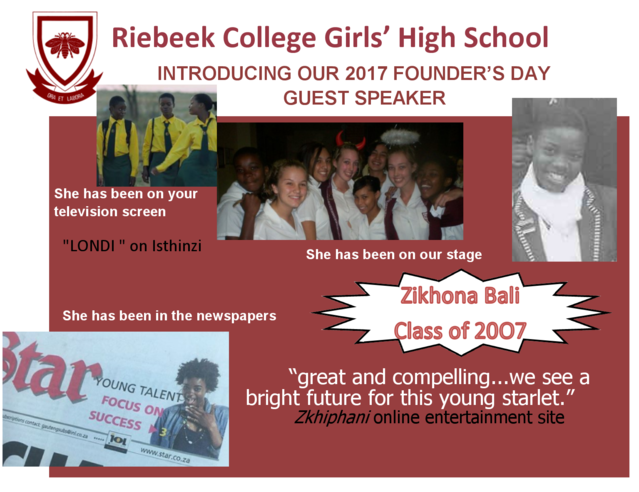 While at school, Zikhona was a school prefect, and served on the drama committee and dance committee. She studied Media Studies and Journalism at Boston Media House, from 2008-2010. Thereafter she worked as a Photographer, a Writer, and a Marketing and PR assistant. 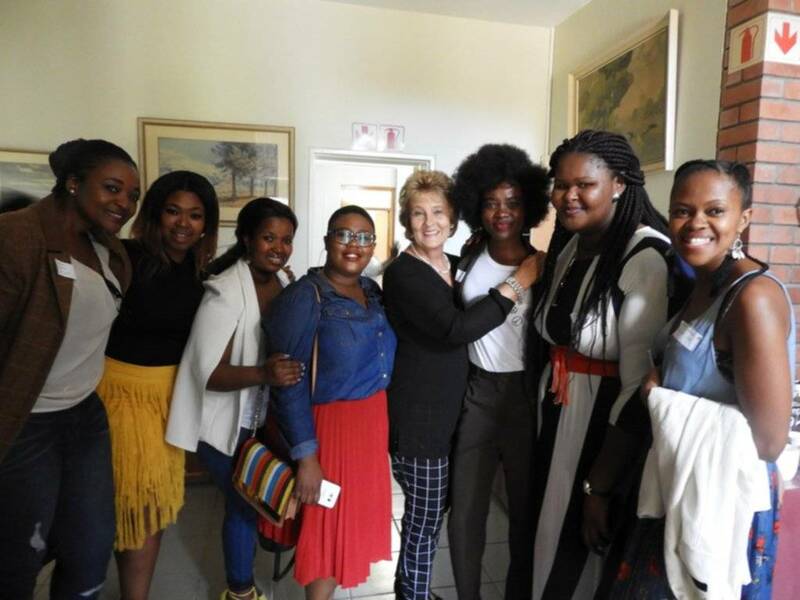 In her matric year, her peers recorded that their “drama queen gave an outstanding performance in Master Harold and the Boys” by Athol Fugard in the annual drama show, Impi. In July 2014, she made her screen-acting debut as Ziyanda in Mfolozi Street and played the same role in 2016 in Season 2. She has appeared in a number of television series; with roles in the Mzansi Magic soapie, Zabalaza, the e.tv soapie Rhythm City and the SABC2 sitcom Gauteng Maboneng. episode first aired in January 2016. In the same year she guest starred in the fourth season of the e.tv drama series Umlilo. 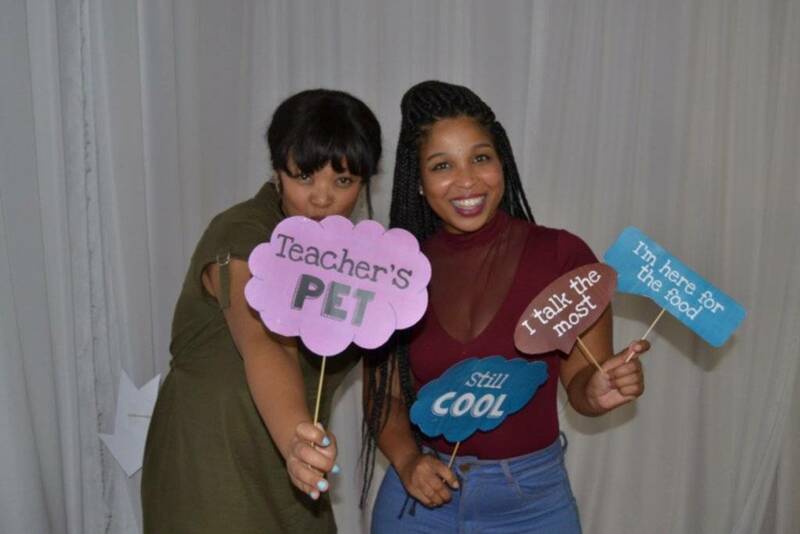 wife who defies her in-laws by returning to school to get her matric.” The show has been praised as a breath of fresh air in the way that it was able to tackle sensitive issues that South Africans face daily. “She is young, black, beautiful and immensely talented. 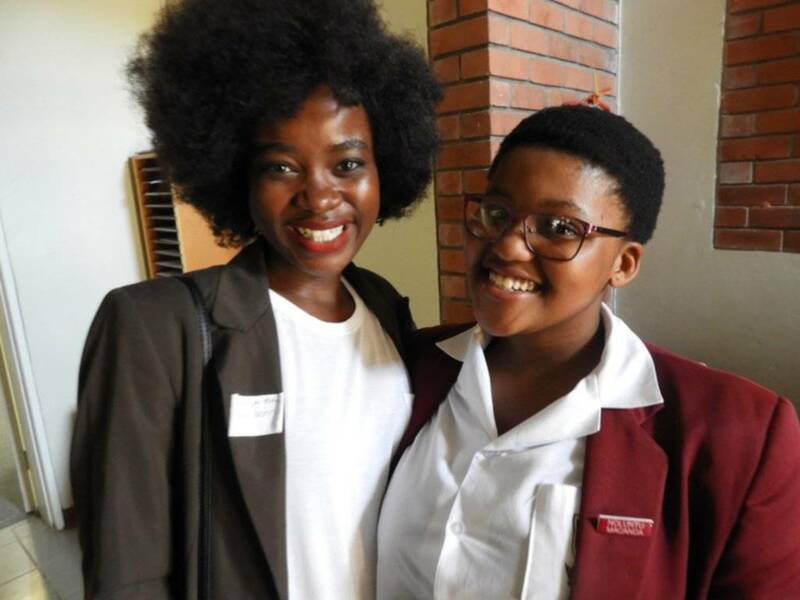 Her matric profile indicated her motto was “Don’t forget where you come from and don’t forget yourself”. We are pleased that Zikhona has not forgotten where she came from and that this humble, endearing young lady with a incredible work ethic and loyalty, was able to get away from her tight filming schedule to be with us today. Ladies and Gentleman, I present to you Zikhona Bali. A breath-taking, radiant morning marked the beginning of our highly anticipated 140th Founder’s Day celebration. 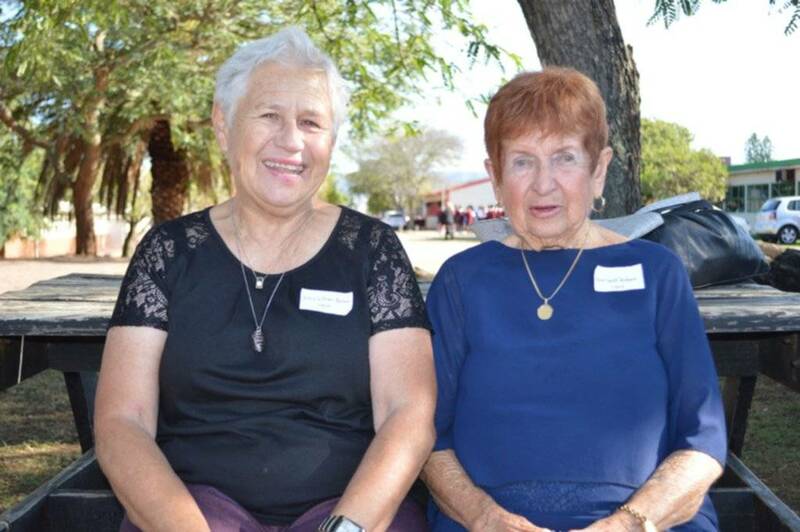 The Old Girls ceremoniously entered their alma mater radiating pride and enthusiasm as memories of school days past flooded their minds and rekindling of old friendships warmed their hearts. They were eagerly greeted by the youthful smiles of their successors and the open arms of their past teachers and class mates. Upon entering the school foyer they were greeted with past and present school magazines, collages commemorating the various reunion groups and continuous camera flashes intent on documenting and preserving every moment. 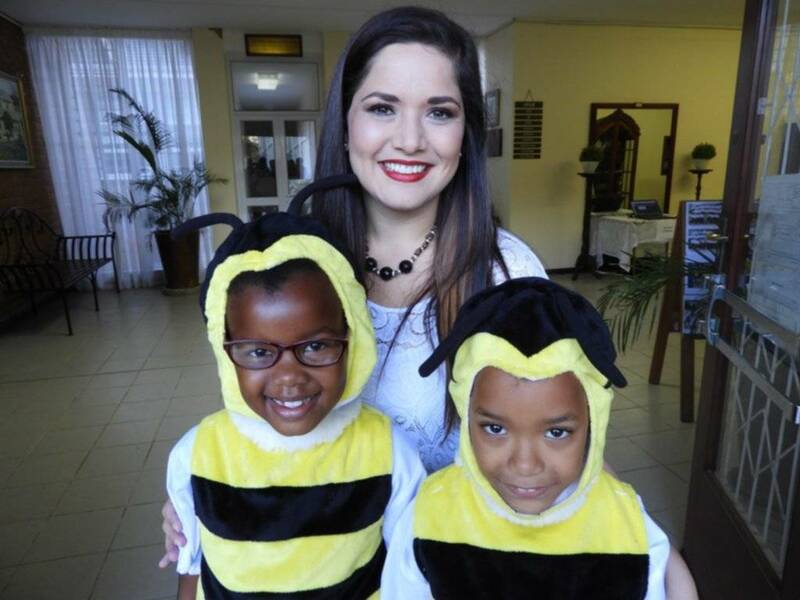 The adorable bees, Vicky Hoffman and Lindokuhle Mbanga, were a particular favourite of the visitors and no one was immune to their charm. 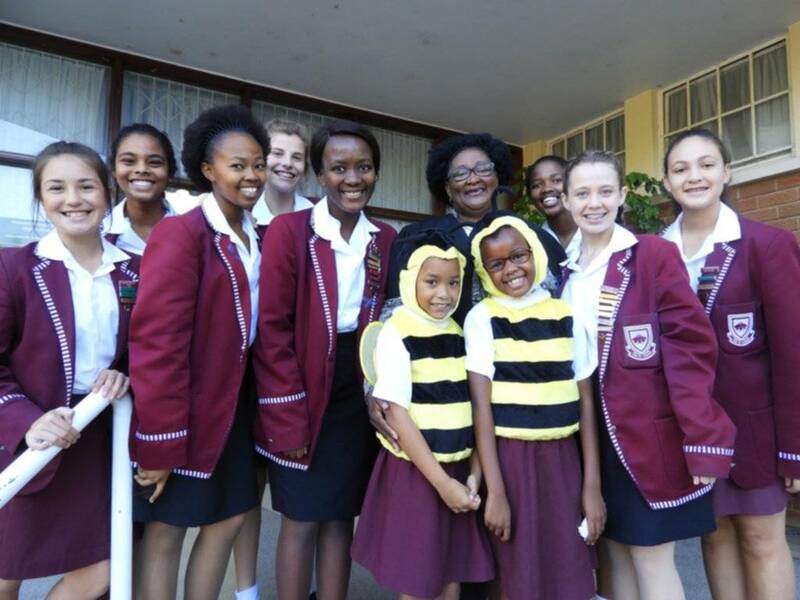 They were lovingly supervised by their “prefect mother” Claire van Rensburg, who made sure her bee babies were kept warm within her blazer. 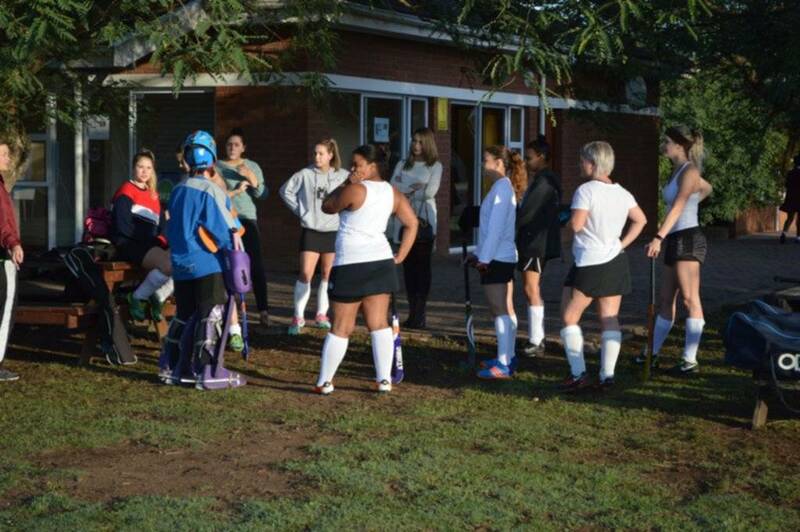 The traditional hockey match between the Senior 1st Hockey Team and the Old Girls’ Hockey Team was soon underway. The various grades watched from the side-lines, showing their support during this intense match and eagerly waiting for the first goal to be scored. The Senior 1st Hockey Team drew 1-1 with the Old Girls’ Hockey Team and both teams received explosive cheers when scoring their well-earned goals. At the end of the match both teams were red-faced and exhausted, but the sportsmanship between them was clear as the players hugged, laughed and complimented each other’s technique whilst trying to catch their breath. 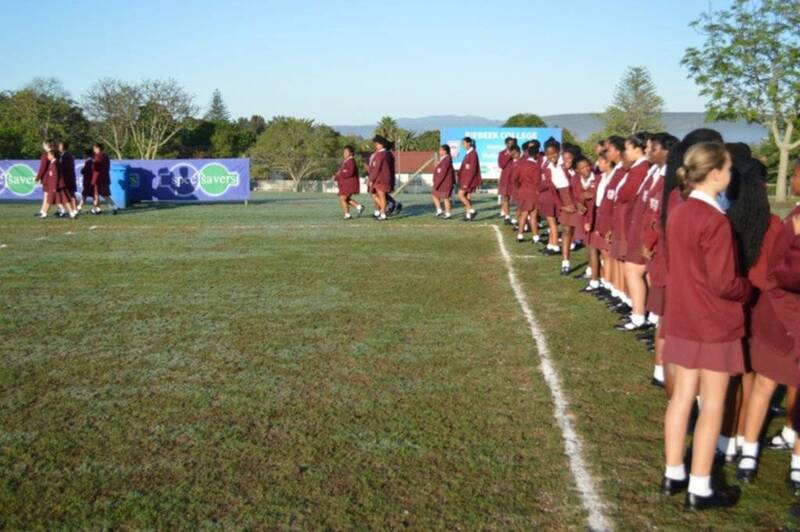 The guests were then treated to the junior school formation on the bottom hockey field. The girls arranged themselves and proceeded to perform their well-rehearsed dance to the upbeat song “Can’t Stop the Feeling!” by Justin Timberlake. Their adorable smiles and enthusiasm also received appreciative applause from their audience as they completed their tribute to the school. As everyone entered the hall they watched the Riebeek Soars promotional video which ended with line “Riebeek gives you wings”. 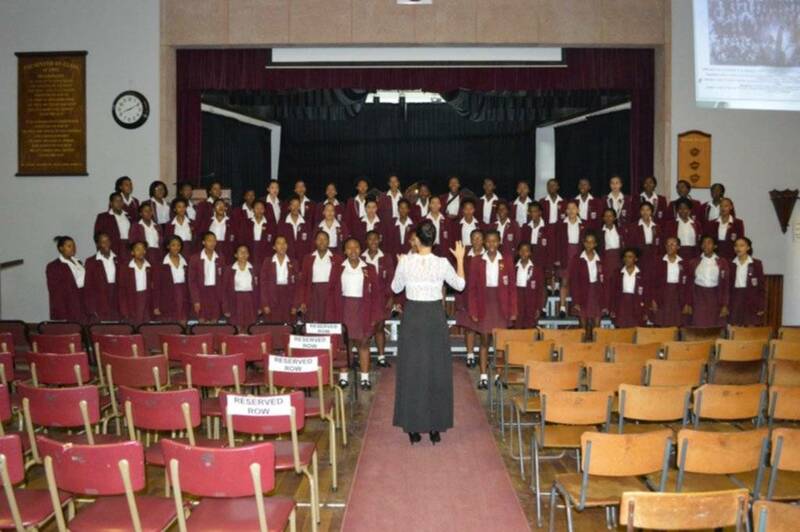 During the assembly all ears were delighted by the melodic voice of Miss Mintoor, a teacher at Riebeek, who performed a hymn for Mrs Stear and the senior choir’s canorous performance received a standing ovation from all in attendance. The performances were followed by the reading of memories which each reunion group wished to share with the girls. Everyone laughed and cheered as stories of drama productions, teachers and friendships were shared and enjoyed. 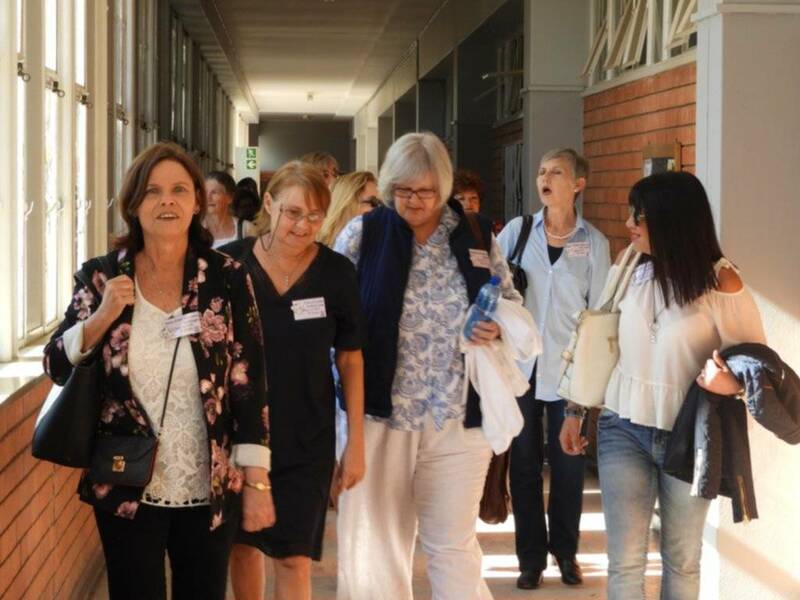 After listening to stories from the class of 1967 and ending with stories from the class of 2007, it is clear that although uniforms have changed, teachers have retired and girls have moved on, the Riebeek girl spirit never changes. 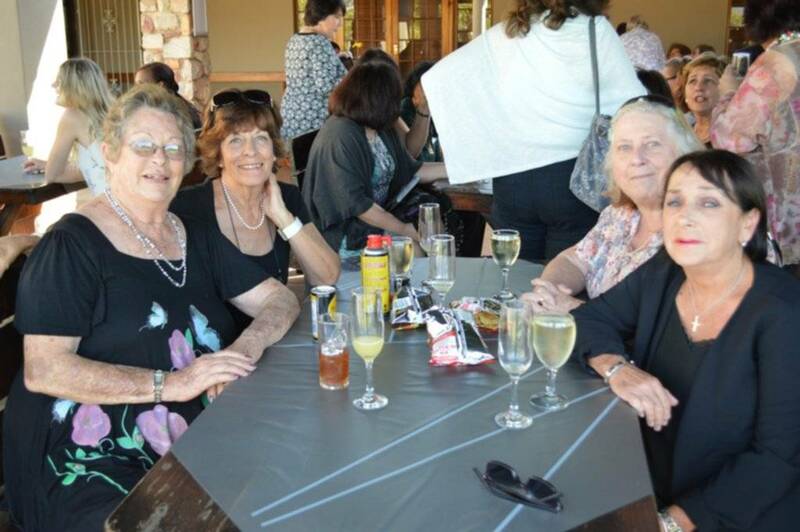 The morals, values, integrity and lively spirit we gain during our time at Riebeek never leaves us, nor does it change as generations pass. 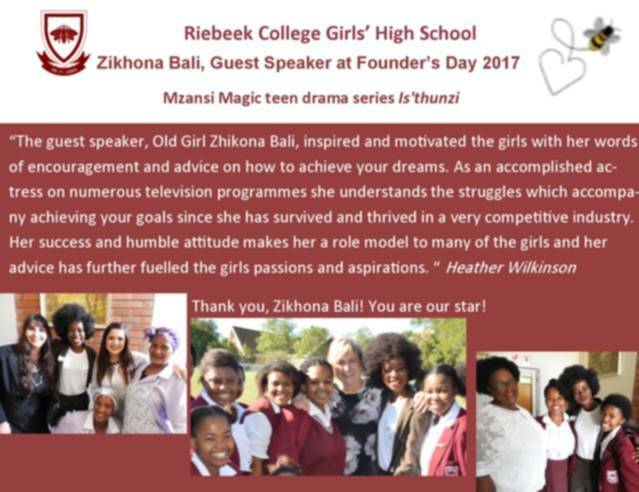 It is clear that Riebeek girls have always been pioneers and innovators, changing their world with their love and passion for life and bringing smiles to the faces of those around them. 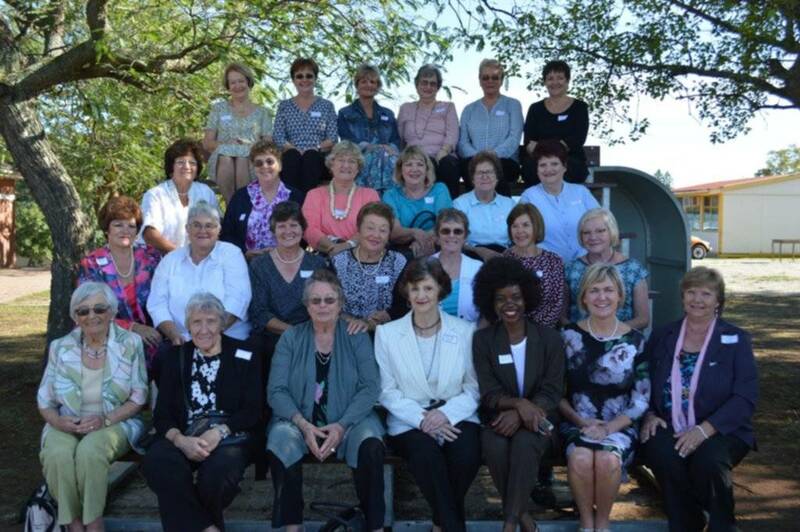 The Class of 1967, with their reunion co-ordinator Mrs Rene van Rooyen Baard, had 19 ladies in attendance to celebrate their golden reunion. 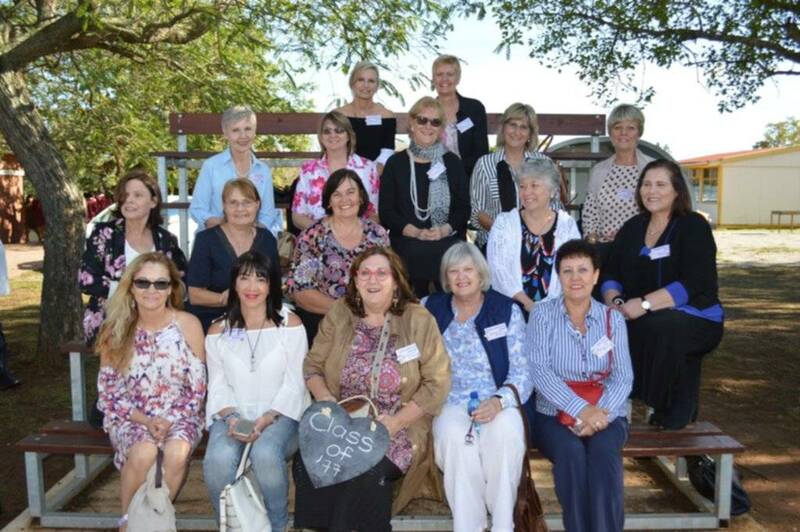 There were 20 ladies from the Class of 1977 in attendance to celebrate their 40 year reunion thanks to their reunion co-ordinators Lesley Bright Young and Mrs Terry van Vuuren Hattingh. 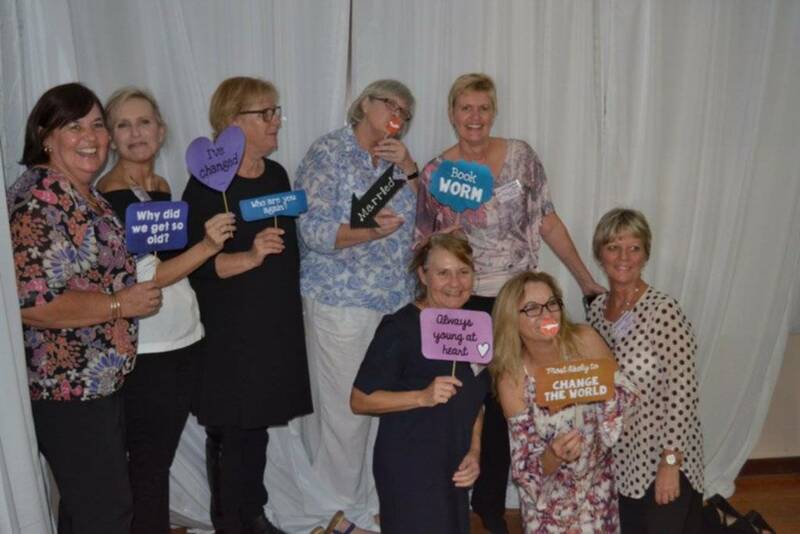 The Class of 1982 celebrated their 35 year reunion with their reunion co-ordinator Debbie Thompson Mattioda and 14 ladies attended. 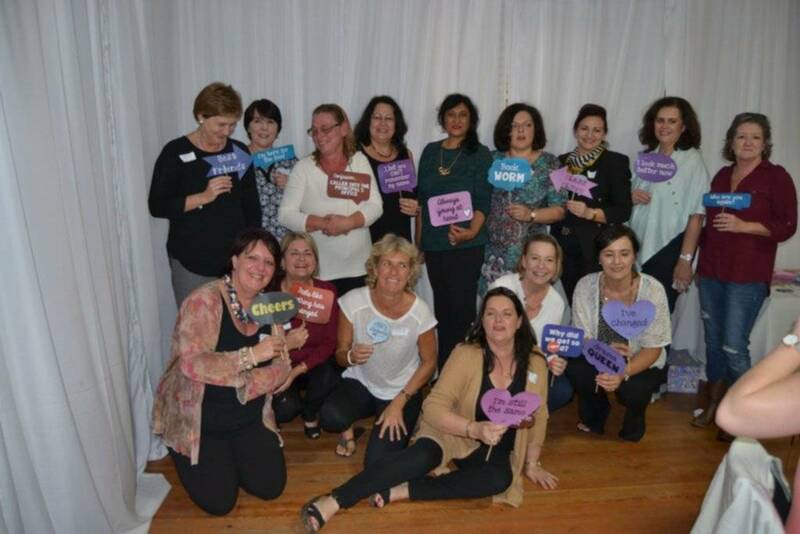 The Class of 1987 celebrated their 30 year reunion with head girl and reunion co-ordinator Claire Soine Breetzke and 16 ladies who attended. 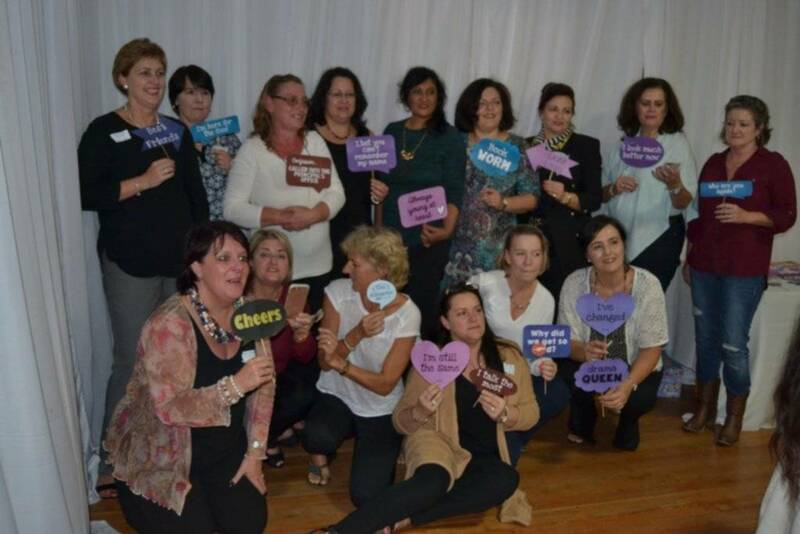 There were 22 ladies from the Class of 1992 who marked their 25 year reunion. 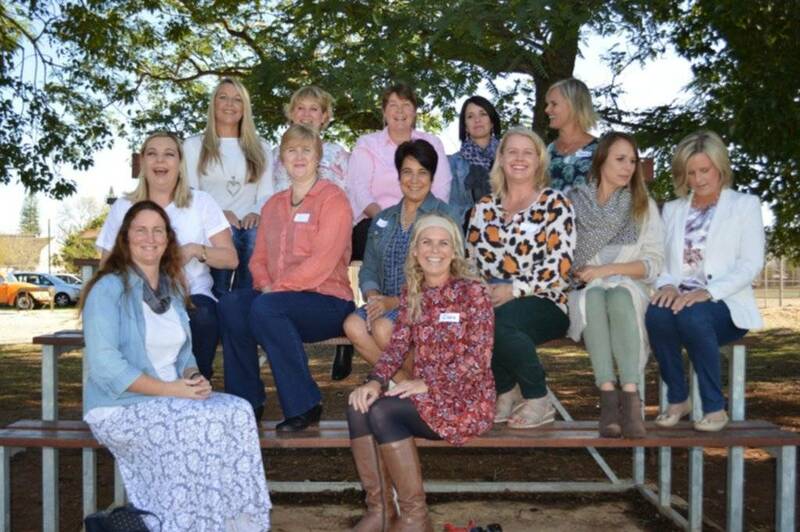 The 20 year reunion group was the Class of 1997 with 13 ladies who were in attendance and Bernadette Meiring as their reunion co-ordinator. 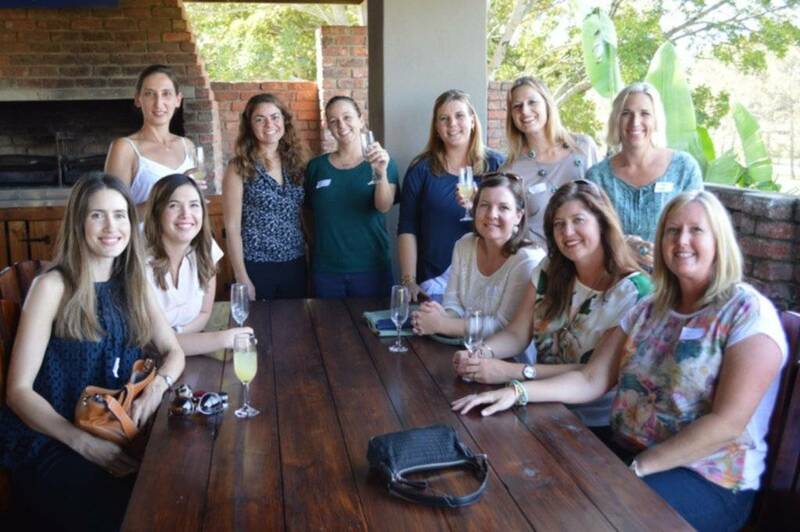 The Class of 2002 celebrated their 15 year reunion with reunion co-ordinator Lindsay Flanagan and 16 ladies in attendance. 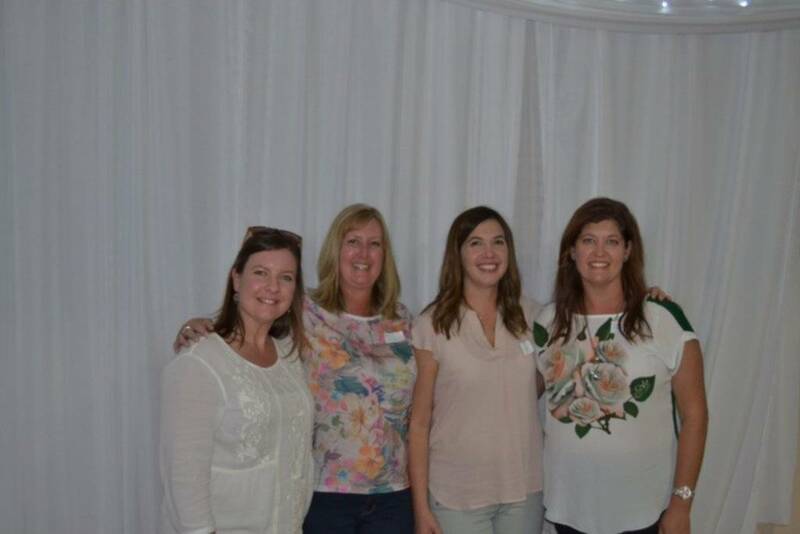 The Class of 2007 celebrated their 10 year reunion with reunion co-ordinators Kelly Dido and head girl Ashanti Heugh (who, unfortunately, was unable to attend). 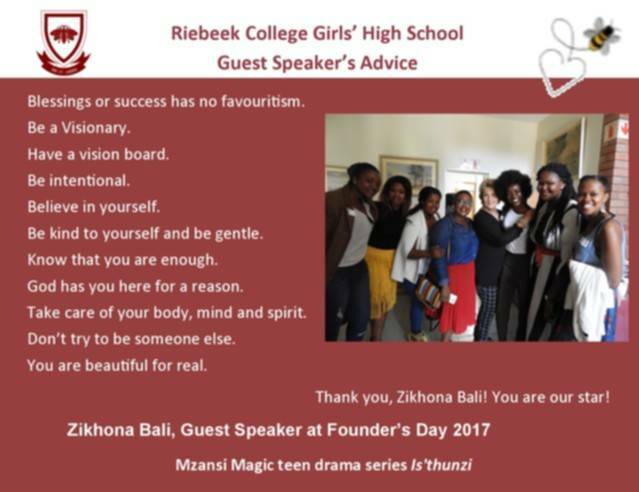 The guest speaker, Old Girl Zhikona Bali, inspired and motivated the girls with her words of encouragement and advice on how to achieve your dreams. 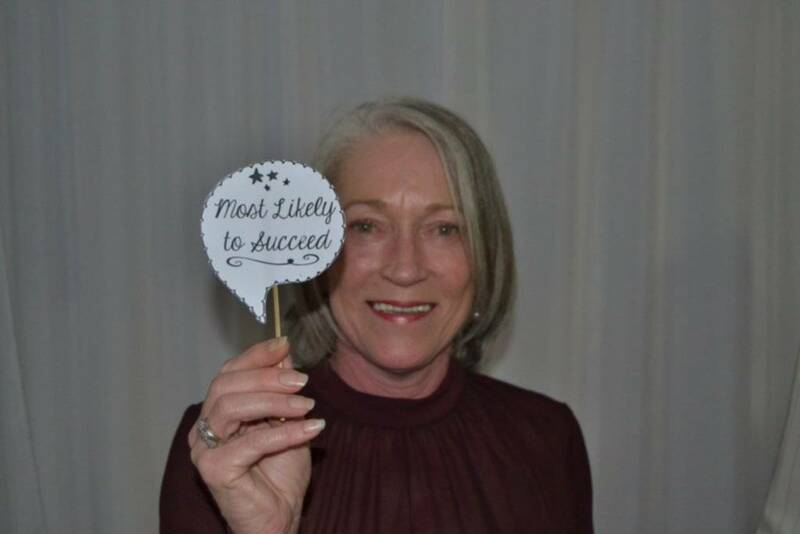 As an accomplished actress on numerous television programmes she understands the struggles which accompany achieving your goals since she has survived and thrived in a very competitive industry. Her success and humble attitude makes her a role model to many of the girls and her advice has further fuelled the girls passions and aspirations. 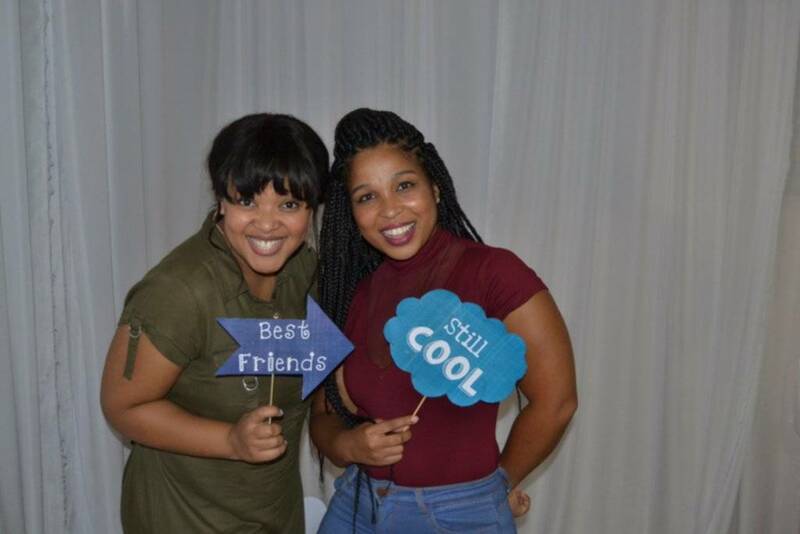 Zikhona Bali matriculated from Riebeek College in 2007. While at school, Zikhona was a school prefect and served on both the drama and dance committee. She studied Media Studies and Journalism at Boston Media House from 2008-2010. 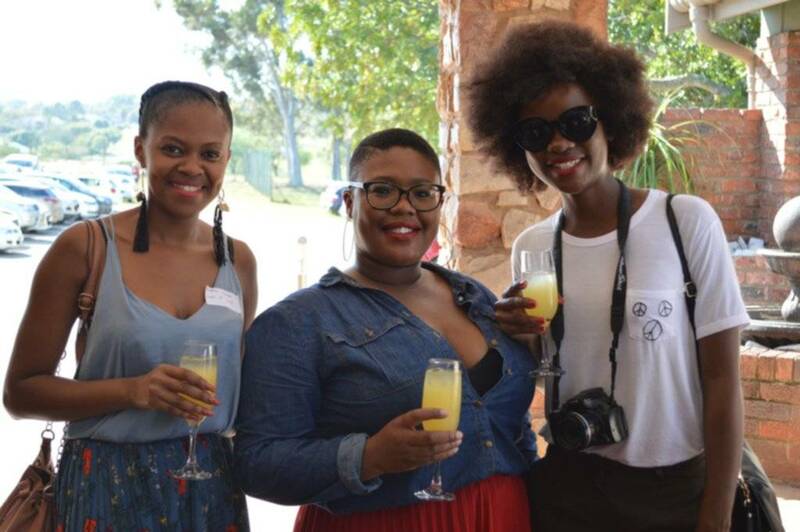 Thereafter she worked as a Photographer, a Writer and a Marketing and PR assistant. 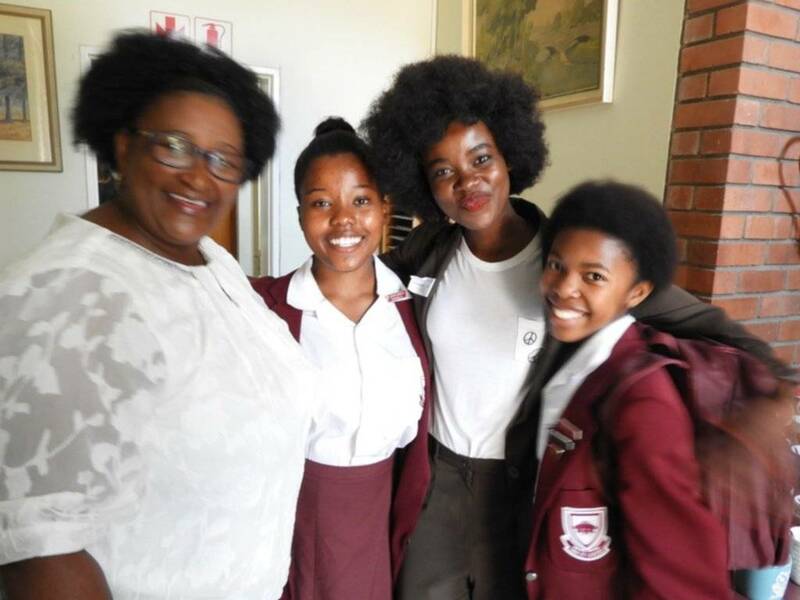 In her matric year, her peers recorded that their “drama queen gave an outstanding performance in Master Harold and the Boys” by Athol Fugard in the annual drama show, Impi. In July 2014 she made her screen-acting debut as Ziyanda in Mfolozi Street and played the same role in 2016 in Season 2. She has appeared in a number of television series; with roles in the Mzansi Magic soapie, Zabalaza, the e.tv soapie Rhythm City and the SABC 2 sitcom Gauteng Maboneng. Zikhona played the lead role in an episode of the e.tv drama anthology series eKasi: Our Stories entitled Thula Thula, about an ambitious young girl whose plans are derailed when her Uncle abuses her. The episode first aired in January 2016. In the same year she guest starred in the fourth season of the e.tv drama series Umlilo. 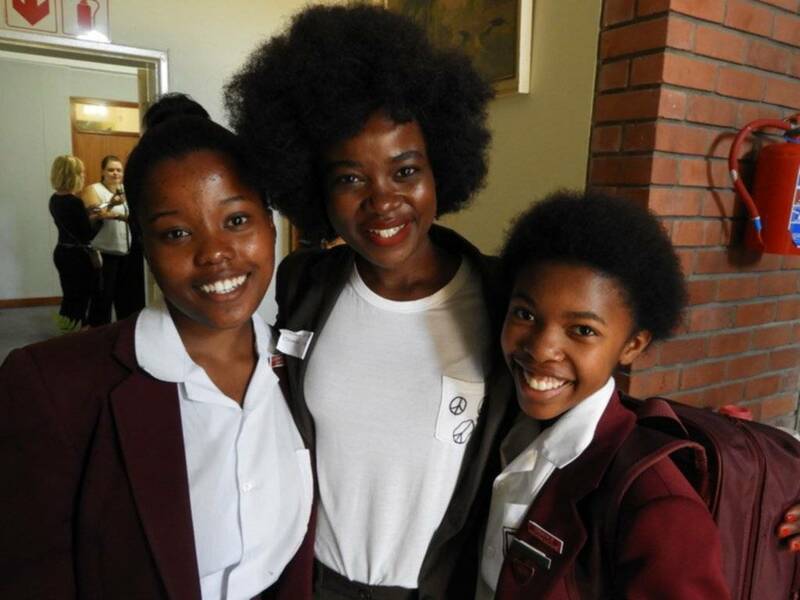 In October 2016, she landed her first starring role on television on the Mzansi Magic teen drama series Is'thunzi which follows the exploits of four girls who call themselves "Ninjas". She plays Londi, a young wife who defies her in-laws by returning to school to get her matric. 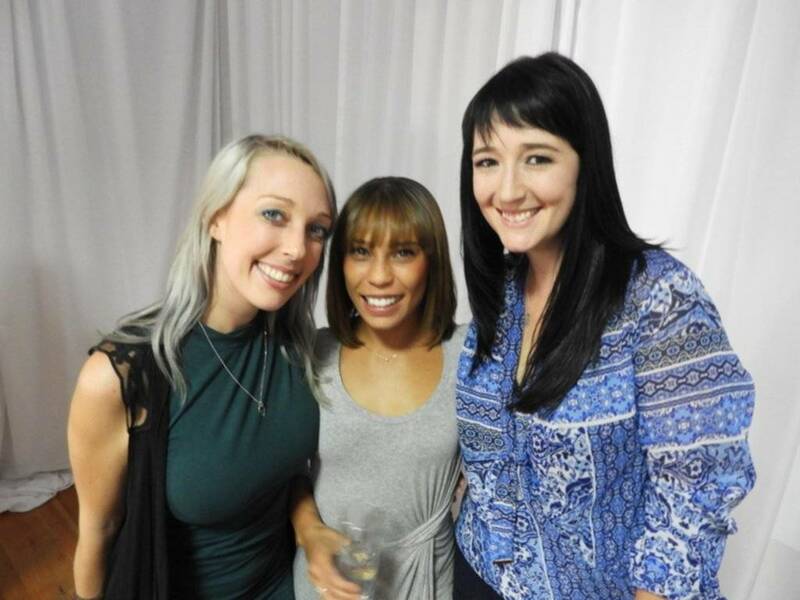 The show has been praised as “a breath of fresh air” in the way it was able to handle sensitive issues that South Africans face daily. 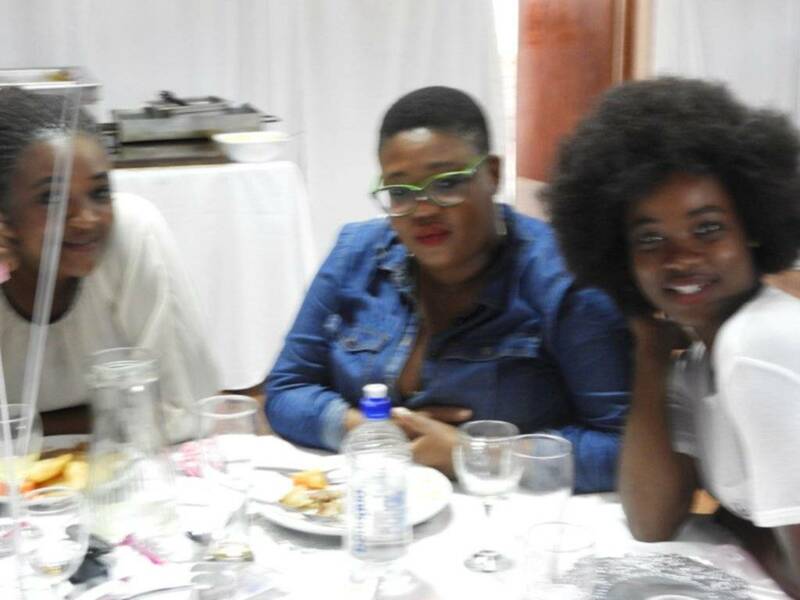 There are advertisements that Zikhona has appeared in on the African continent and there is a short clip circulating on the internet where Zikhona conveys in a few seconds with only a roll of the eyes and a hesitant look at her complaining mother more than an entire script of dialogue. 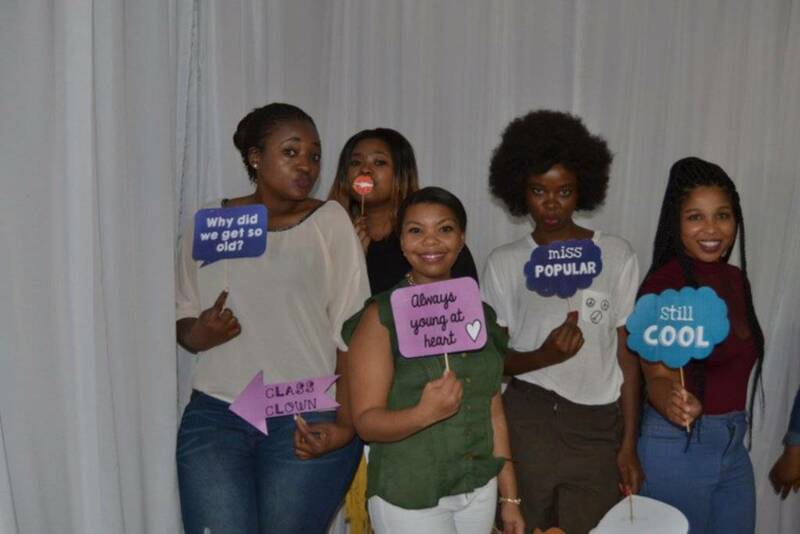 Her matric profile indicated her motto was “Don’t forget where you come from and don’t forget yourself”. We are pleased that Zikhona has not forgotten where she came from. 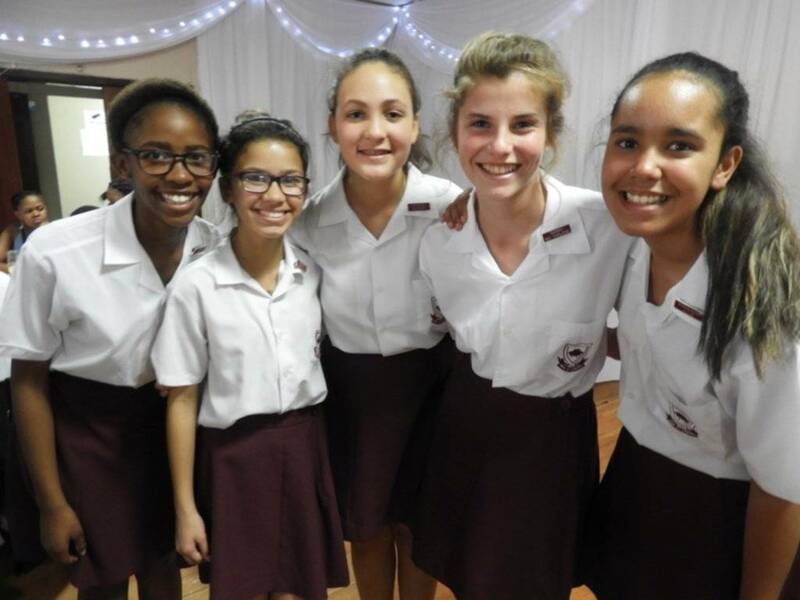 A special thank you to the junior prefects who assisted at the luncheon at the Uitenhage Golf Club, the senior prefects who were ushers on the day, the media committee, First Aid, Mrs Gerber and the teachers who helped organise the event. 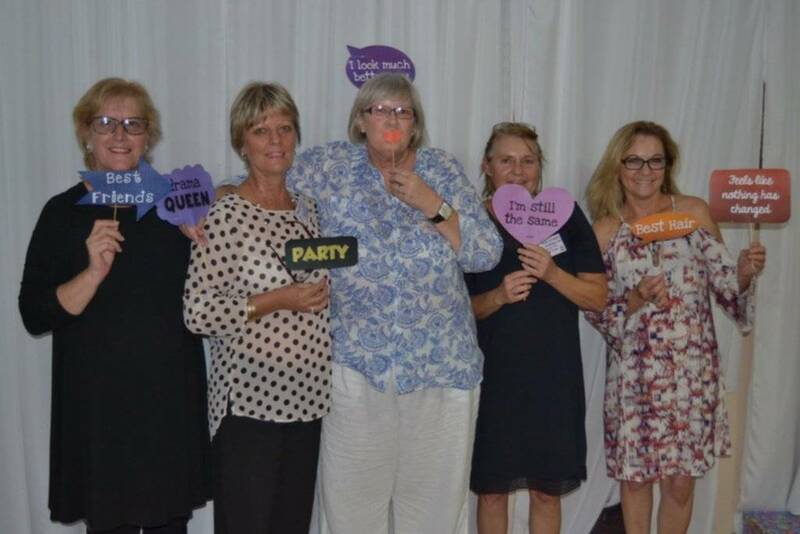 Our thanks is extended to the RCL who distributed the birthday doughnuts and juice to the Riebeek girls and Carleen Braun for running a photo booth for the Old Girls. 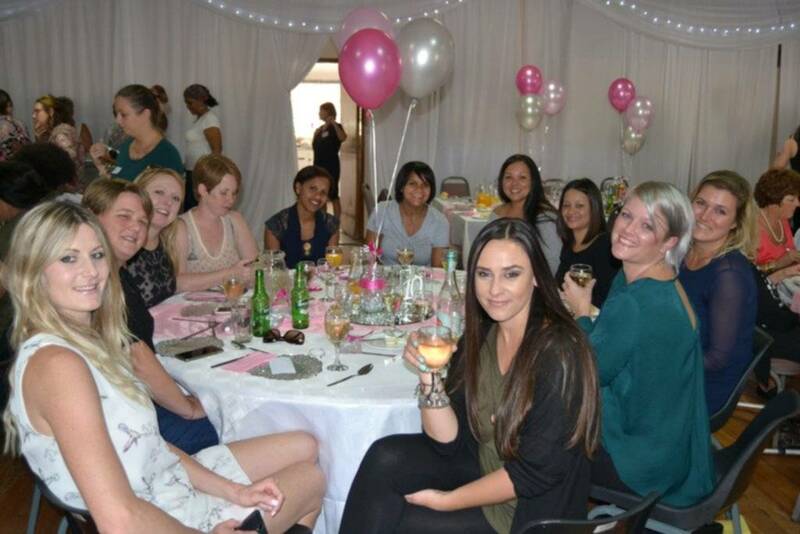 We also thank Miss Hattingh who arranged the delicious luncheon and stunning décor which catered for over 120 Old Girls. 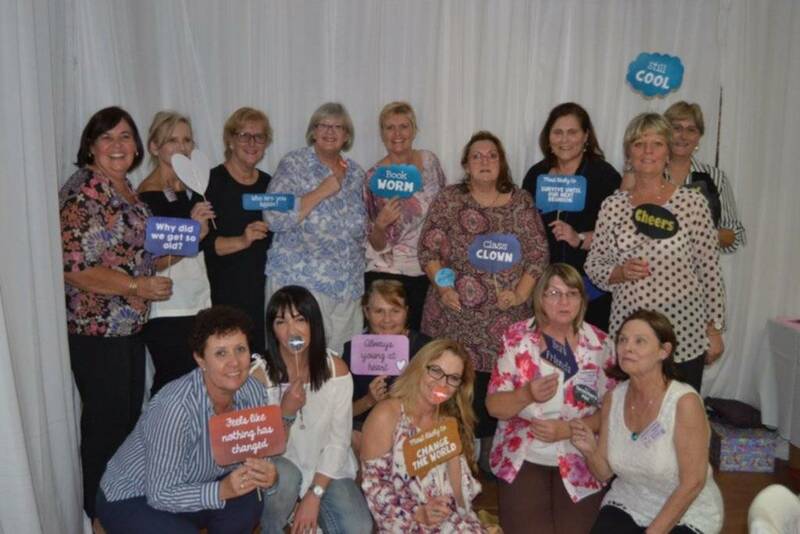 Each lady received a Riebeek branded gift of lip ice with a beautiful reunion poem. 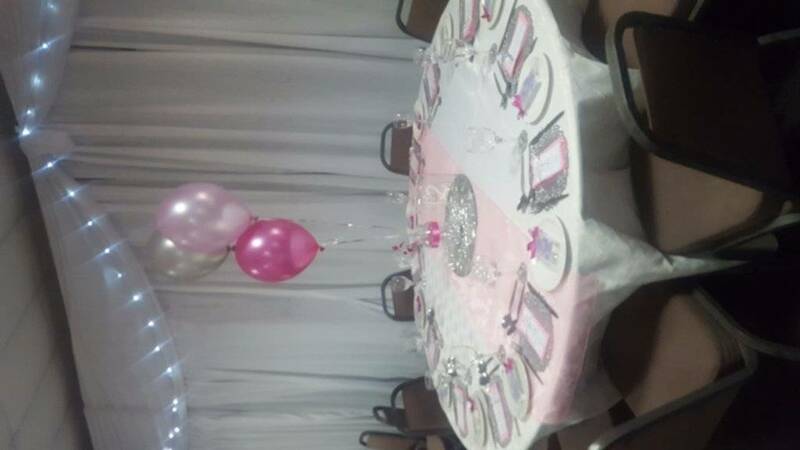 The venue was beautiful with pink and white balloons, fairy lights and touches of magic. When the time came to part ways the nostalgia and joy had not yet left the hearts of many of our Old Girls. 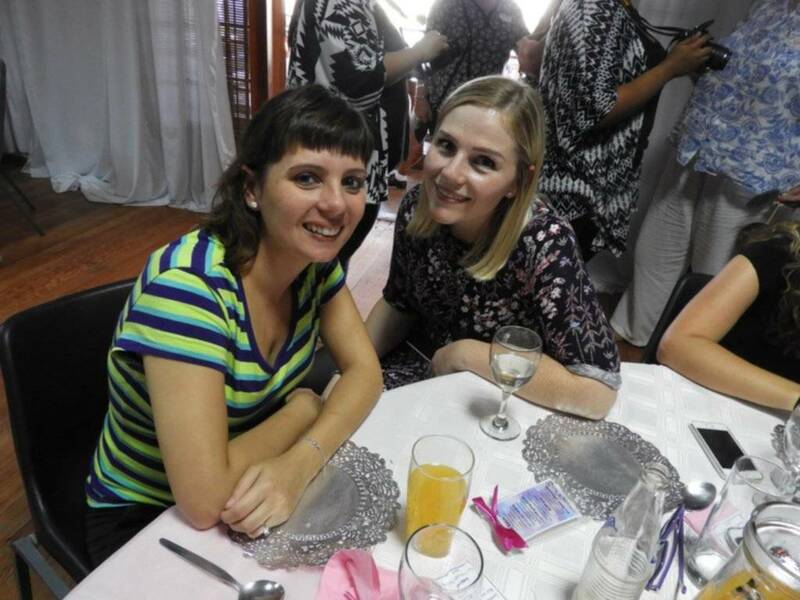 They left Riebeek with plans of further lunches and get togethers on their lips, intent on continuing the pure happiness which had consumed them throughout the day. 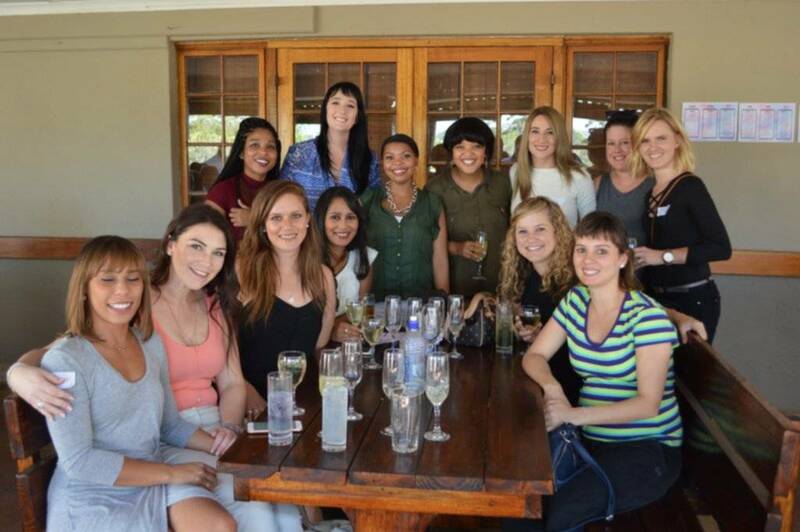 It is definitely true that once a Riebeek girl, always a Riebeek girl. - Outstanding performance in her matric year in an extract from Master Harold and the Boys by Athol Fugard in the Impi drama production. Zikhona Bali as #WCW on online entertainment site: “She is young, black, beautiful and immensely talented so you know we had to put her on this. In case you don’t know who Zikhona Bali is, she is an actress who is best known for her portrayal of Ziyanda in Mfolozi Street, a SABC 1 drama series. The beauty holds a diploma in Media Studies and Journalism at Boston Media House. She has worked as a photographer, writer as well as a marketing and PR assistant. Beauty and brains I tell you! 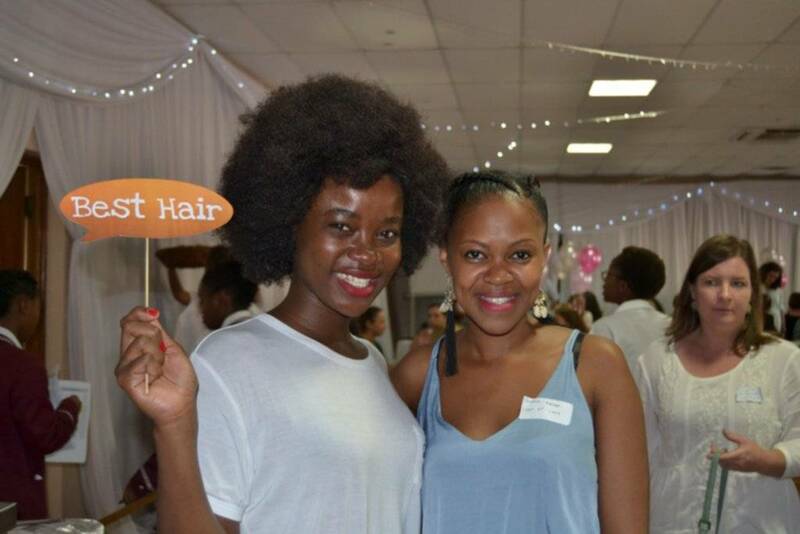 Her other roles include Palesa in the Mzansi Magic soapie Zabalaza and the SABC 2 sitcom, Gauteng Maboneng as Anda. She also guest starred in the e.tv series Umlilo and soapie Rhythm City. All this happened back in 2015. Last year proved to be a great year for the incredible actress as she was cast as the lead in a short story titled Thula Thula for e.tv’s eKasi: Our Stories. She was also cast in the Mzansi Magic teen drama, Is’thunzi, her first starring role as Londiwe. 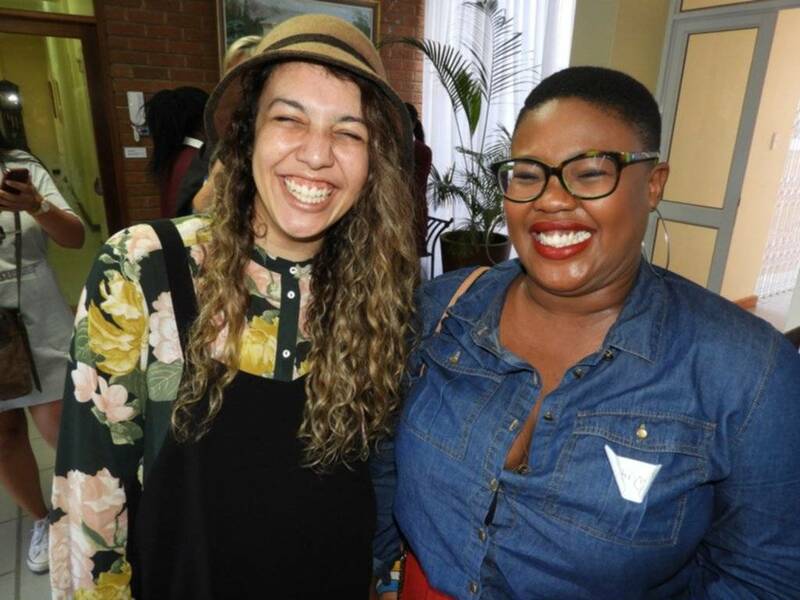 The show has been praised as a breathe of fresh air in the way that it was able to tackle sensitive issues that South Africans face on the daily. It has been rated up there with legendary shows such as Soul City and Home Affairs- now that is major. Bali’s performance on the show was also hailed as great and compelling. 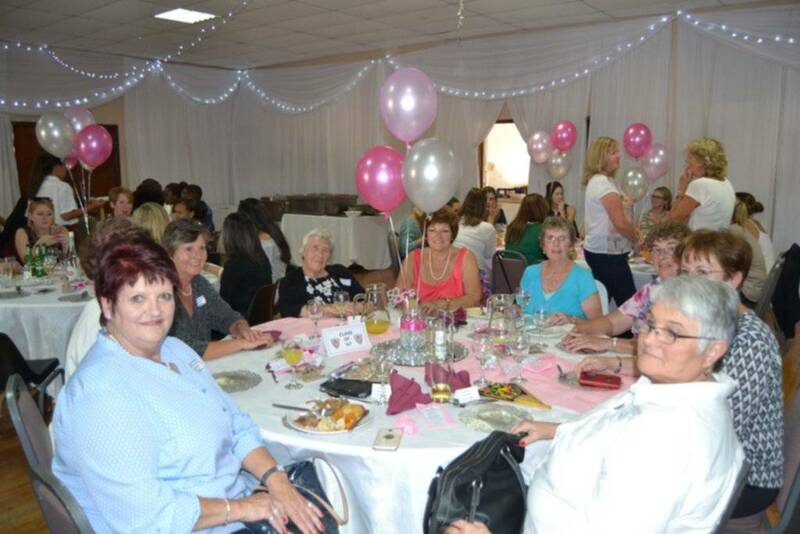 There will be an Old Girls’ Lunch at the Uitenhage Golf Club at 12.30 for 1 on 5 May 2017 at a cost of R140 for a three course meal. Reunion groups are especially requested to attend. Make a payment with the reference being your surname followed by year of your reunion group. 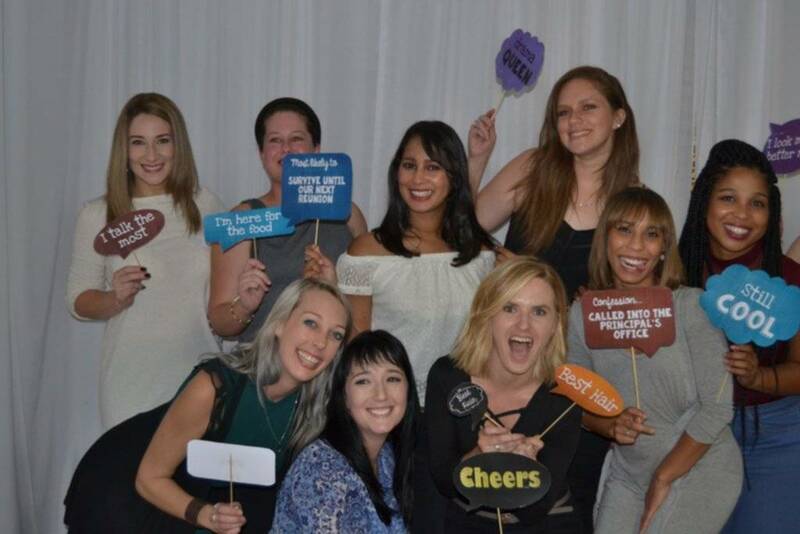 Proof of payment MUST be forwarded to bursar@riebeekcollege.co.za along with any seating, dietary requests, maiden name/ married name and class year. Do cc your reunion co-ordinator when confirming payment. Please promote the hockey festival to your group We are excited that our annual Hockey Festival will be on 6 May and hope that the Old Girls will support. 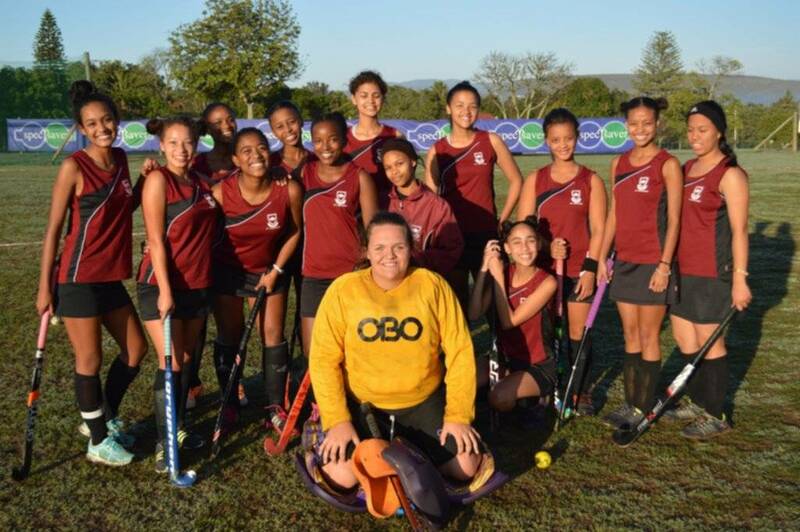 We particularly hope that the Class of 2007 will all be at the Hockey Festival as it is organised by one of your class, Miss Theresa Bezuidenhout Woods. Collect photographs (scanned in for digital versions) for sending to me; and create the posters for the boards for display in the foyer on Founder's Day - these posters go up on the day or the day before: The measurements of our black boards are 1.37m (height) by 900cm (width) and we have larger white trestles that measure 1.2 m(width) by 1.8 m (height). 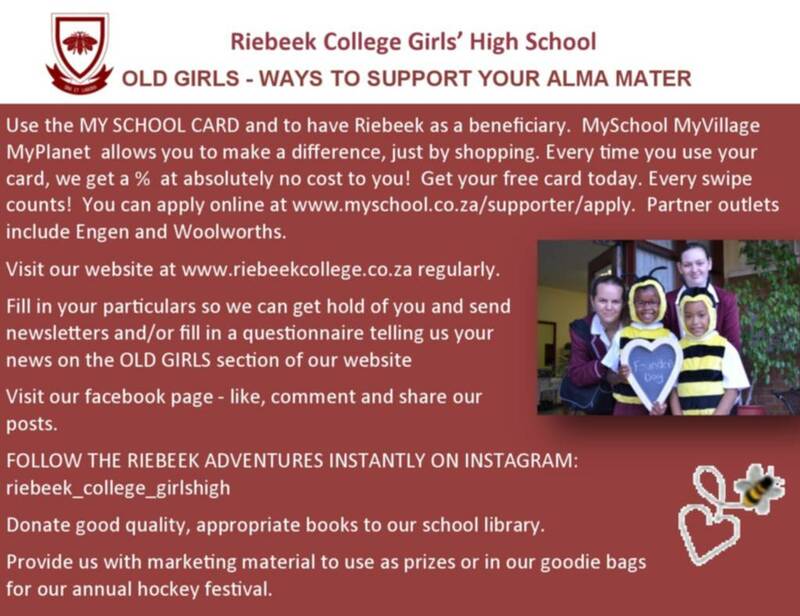 Encourage the ladies to have a Woolworths My School card with Riebeek as the beneficiary. You can apply online at https://www.myschool.co.za/supporter/apply. Partner outlets include Altech Netstar, Cartridge Recycling: greenOFFICE, Engen, kalahari.com, MegaMobi, MySchool Holidays, Power24.co.za, Reggies, Toys R Us, Waltons, Woolworths, Woolworths Rewards. 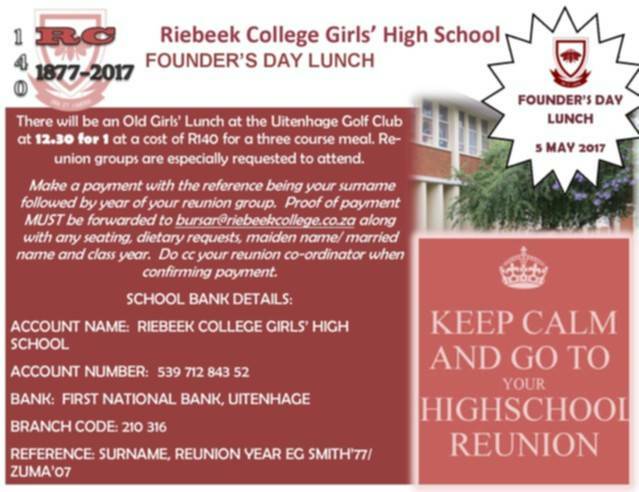 All past pupils of Riebeek are invited to attend all the events of the day, with the reunion groups especially requested to attend. Reunion groups are also especially requested to attend the lunch. Reunion groups who wish to make a donation to the school should contact Mrs Woods to discuss a specific item or could make a financial donation to Mrs Woods for her to allocate the funds to a project on our list. 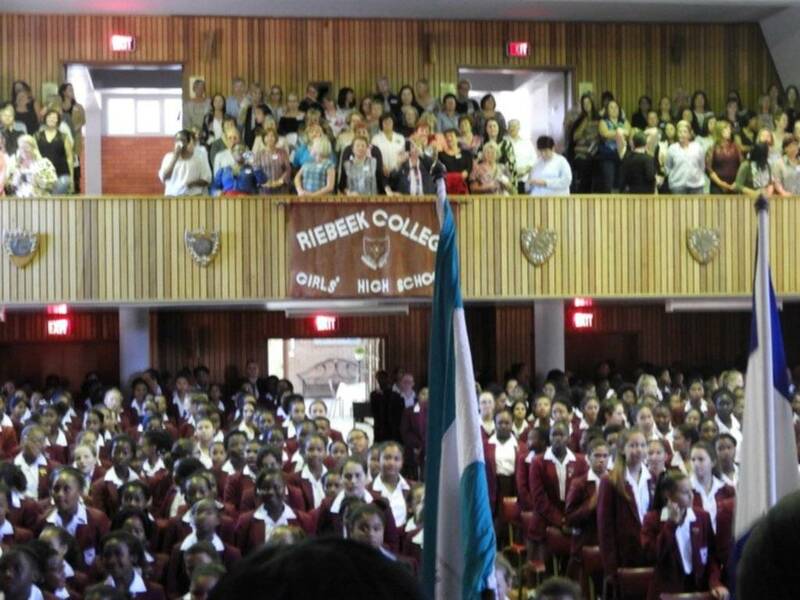 Please email the following information to info@riebeekcollege.co.za : photographs; names of those who have passed away between May 2014 and May 2015 (not necessarily from your class: first name, maiden name, surname, year of matriculating); names of those who have travelled far, those who have passed away from your class and any special messages of goodwill or greetings from your reunion groups; a list of any special memories of your school years to include in our speeches, names of those attending. This can be sent in stages as you collate your information. Warm Riebeek Regards. Looking forward to seeing you.